Well, North America, I had almost given up on you. Over the years, I have watched in horror as every time I visit Toronto, one more of the few struggling independent bookshops has closed its doors for good and no one has kicked up any fuss about it. Long have I shaken my head in dismay, long have I wagged my finger in disapproval, long have I made (possibly unfair) pronouncements about the defects of an entire continent that is more interested in the latest gadget than preserving books, art and music, the little places (bookshops, libraries, museums and galleries) where peaceful spaces open up into a world of adventure. 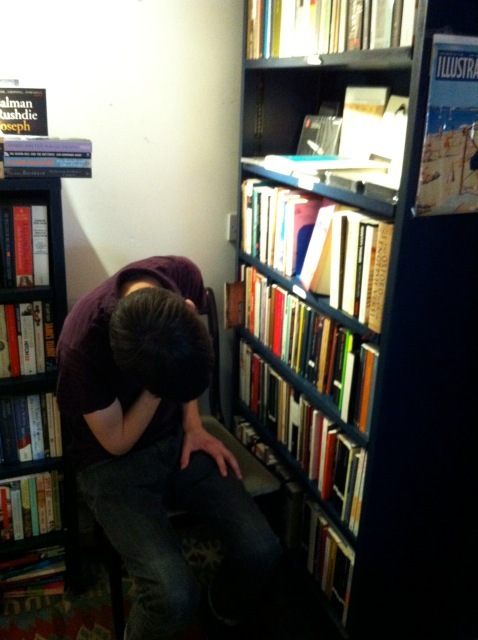 I was just about to give up, become world-weary before my time and conclude that future generations of weird kids with over-active imaginations and more creativity than social skills will have to go without the comfort and the joys of real books and rooms full of them. Then I met Type. Hallelujah, I thought, there might just be hope for them yet. 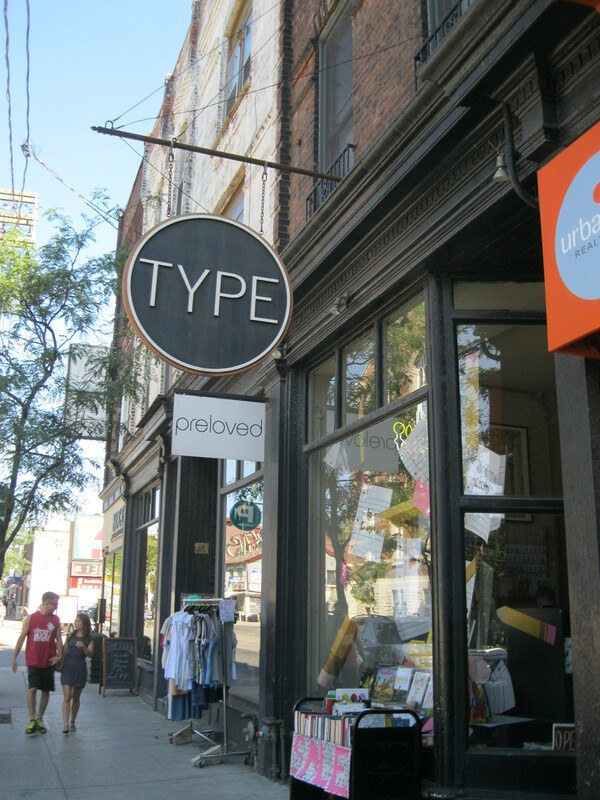 For even in a difficult economic climate, and in a social climate that is wholly disheartening to those who want to live by books, Type has succeeded. 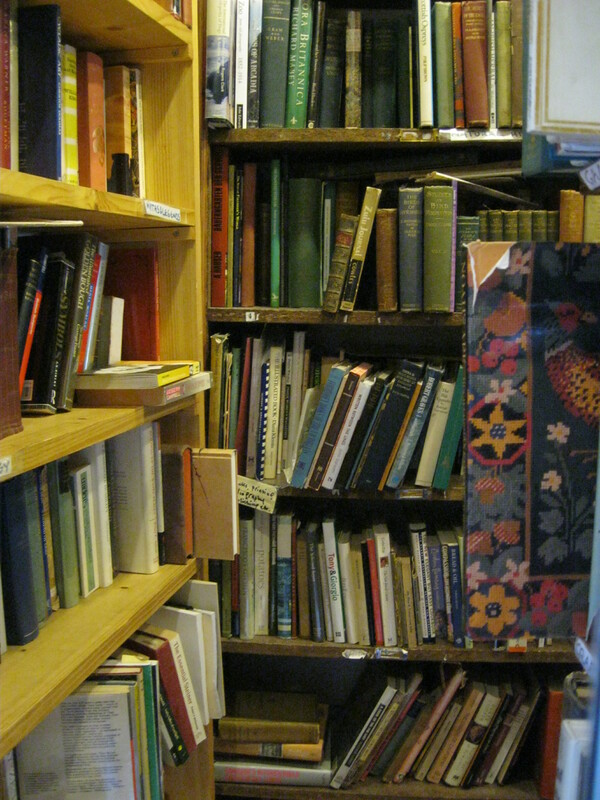 I, for one, am relieved to know that even if other great bookshops in this city (a moment of silence, please, for the late and great Nicholas Hoare Books) are dwindling in numbers and having to close, Type marches on in its quest to bring a bit of colour and a bit of joy back into the lives of Toronto’s bookworms. That sense of joy hits you before you even enter the shop. 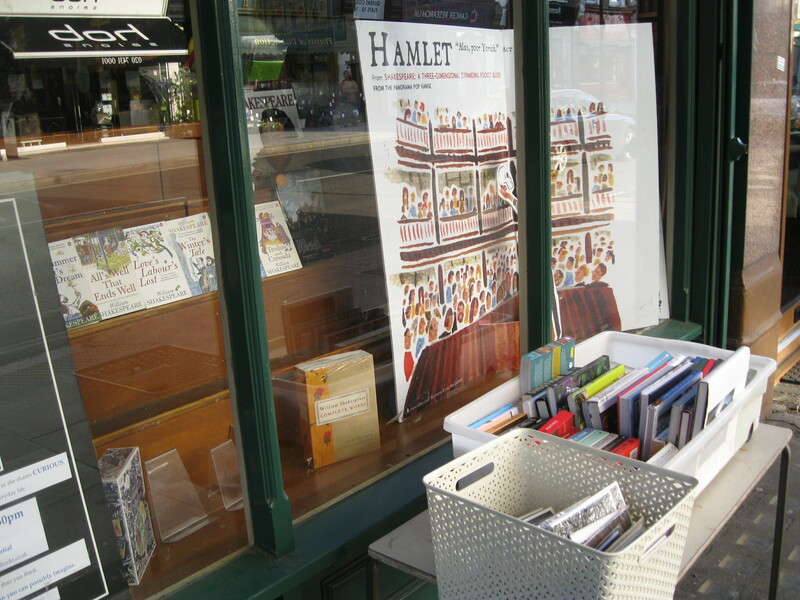 The display in the front window of the bookshop changes regularly, but is always inviting. 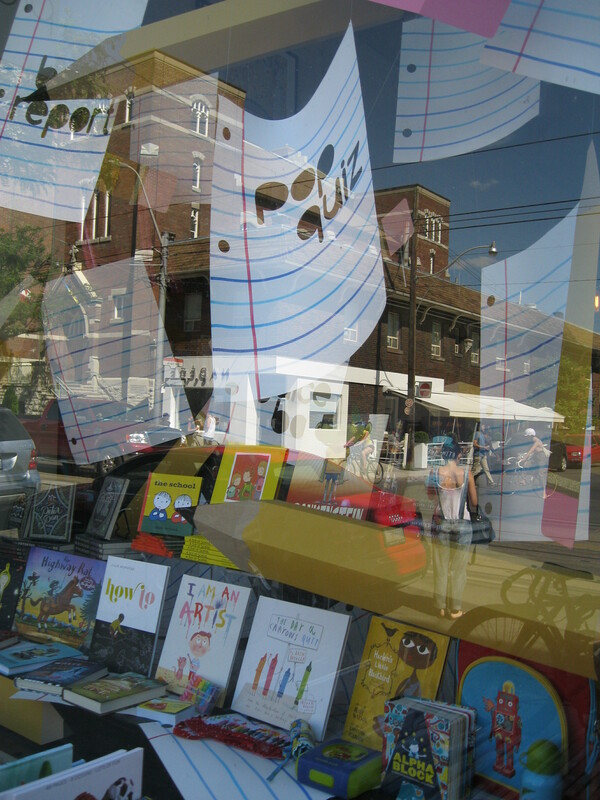 In late August when I visited, a back to school display featured pieces of white paper, covered in handwriting whimsically floating through the air, suspended above a selection of relevant books. The effort put into creating such an inspiring and imaginative display, sure to draw in even the most school-resistant child, suggests that this is a place where the beauty and magic of a book, the miraculous potential of a blank page, does not go unnoticed or uncelebrated. Inside, the large shop has a spacious layout, which might seem a bit too impersonal with its cold bare floors, were it not for the stubbornly unfashionable, but comforting and homely decorations on the walls. Several different colour schemes and loud patterns dominate different parts of the shop and multi-coloured bunting pops up here and there so that the whole place feels a bit like your wacky aunt decorated it. But at Type, it works. 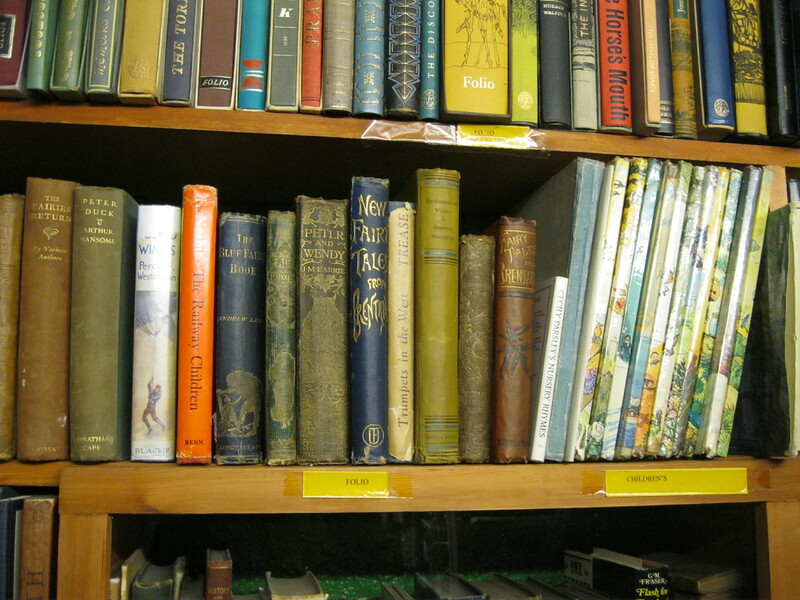 The walls are as colourful as the books themselves, which are the main focus, as they should be. Type illustrates their understanding of the charm of books themselves – without gimmicks or cross-promotional merchandise – in their creative and stunning video advert called The Joy of Books. If you have been living under a rock for the past year and still haven’t seen it, watch this video (once, twice or on repeat) to be reminded of the potential for magic that is latent any time a reader is presented with a shelf full of books. I always feel awe when I enter a bookshop or a library or the house of a particularly accomplished collector and see, standing in front of me, a small sample of mankind’s genius, the creative and intellectual output of our civilisation, expressed in more words than I could even hope to read in a lifetime, right there, available, waiting to be opened and for the dance of the words on the page begin. A Kindle or an Ipad fails to give that impression of greatness, durability and possibility. 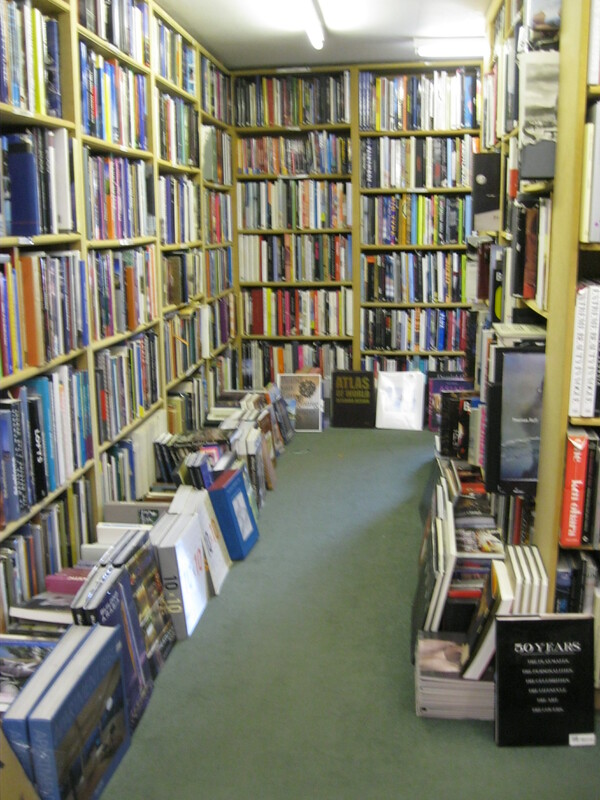 Even if it contains a million ‘books’ (or files as I call them, since that’s all they are) the Kindle cannot impress the reader in the same way a good bookshop does. It will never make us realise – through the sheer presence, the endearing physicality of paper pages you can touch – the amount of words we have not read, and the possibility that they might all change our lives the way a shelf of unopened books can. At Type, I could sense the legendary words and timeless expressions of thoughts and emotions around me. Surrounded by so many beautiful and important books, I could almost hear them whispering, promising to share their secrets if I was willing to pick one up and sit with it for a while. 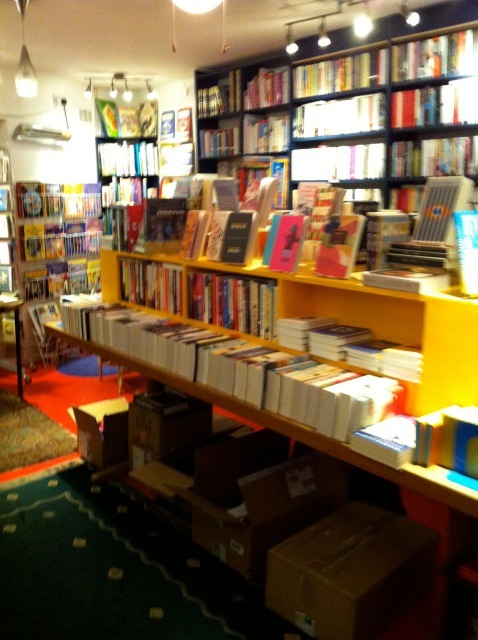 The collection that the booksellers at Type have accumulated is so brilliantly-curated that browsing through it, you can tell that any book in the selection might change your life. 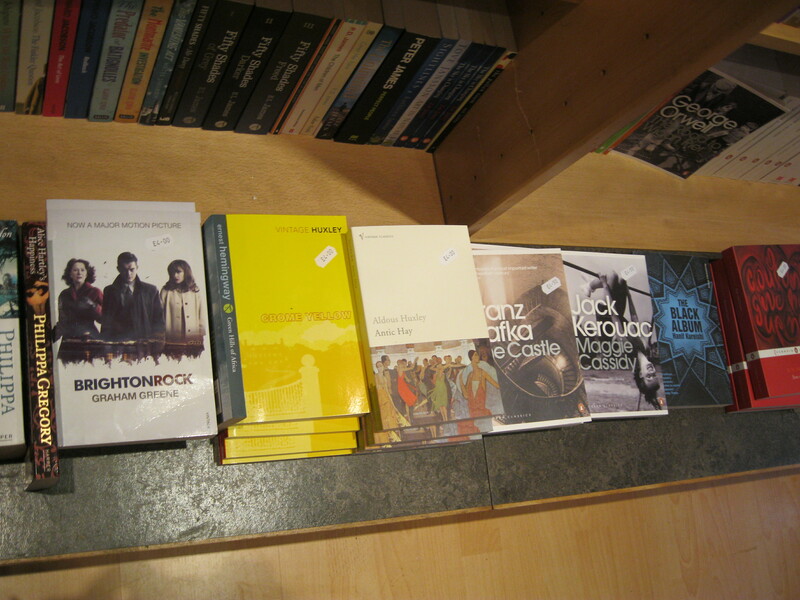 A well-stocked selection of classics is of course mandatory, but the wide range of fiction titles available is refreshingly contemporary. The balance between old and new is just right, as if to remind us that we are nothing if we do not know our past, but that that past should no longer define us. In order to help us break free from it, Type offers novels by the greatest writers of our generation and less famous authors who nonetheless deserve our attention. The poetry section also mixes old and new in exciting ways and encourages the browser to try something they never would have found on their own. 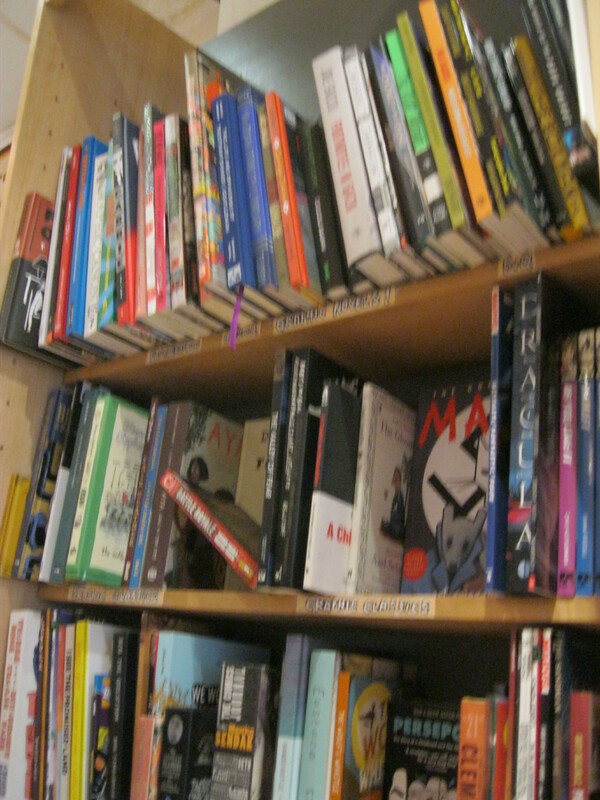 The selection of graphic novels is large, which is appropriate for a form finally coming into its own and being taken seriously. Personally, I think it might prove to be an invaluable new genre for the internet generation to express its understanding of its own time. 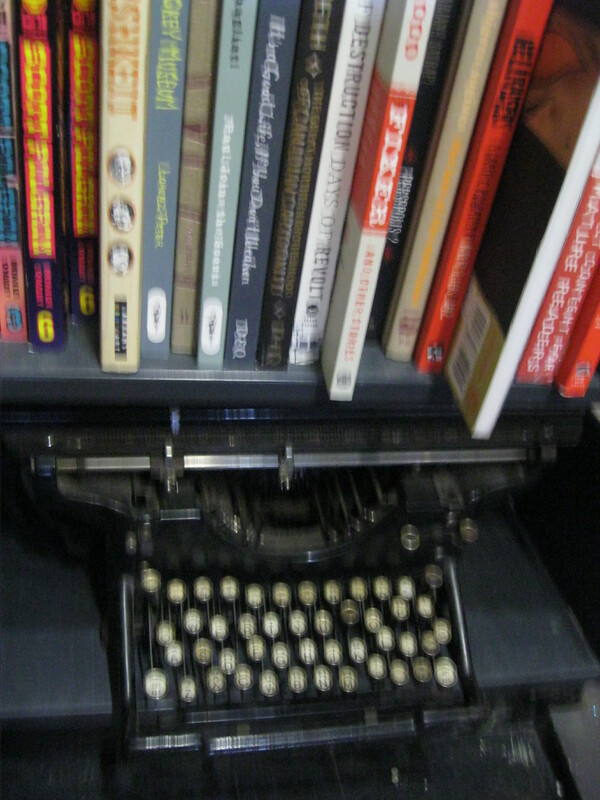 Despite how new and fresh the genre is, at Type, a small typewriter is nestled in a the base of this section, perhaps so that we don’t get too carried away and forget that all books, no matter how innovative the format, are simply the result of the miraculous combination of black letters on a white page. There are also superb history, politics, philosophy and religion sections where the range of inspired and significant titles simultaneously excited and intimidated me. 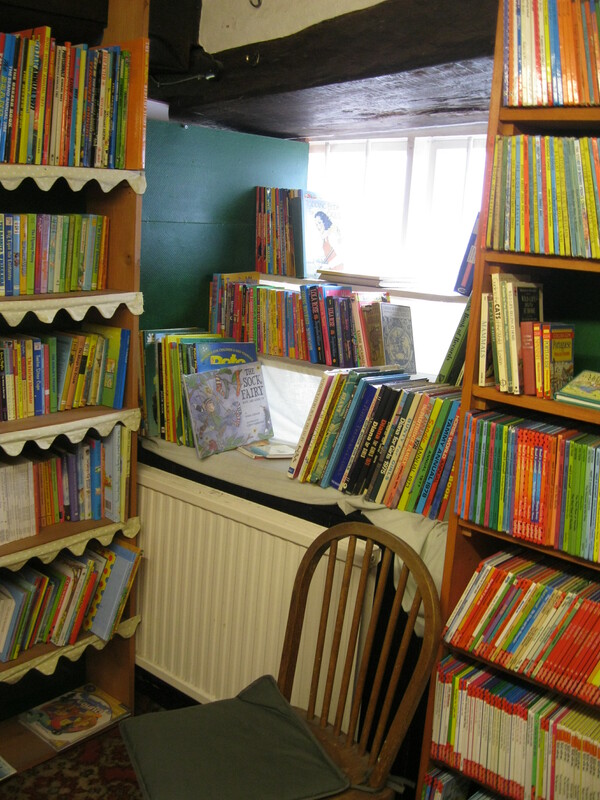 And in the back room, beyond the cook book section and books on all kinds of crafts and activities, there is the children’s section. 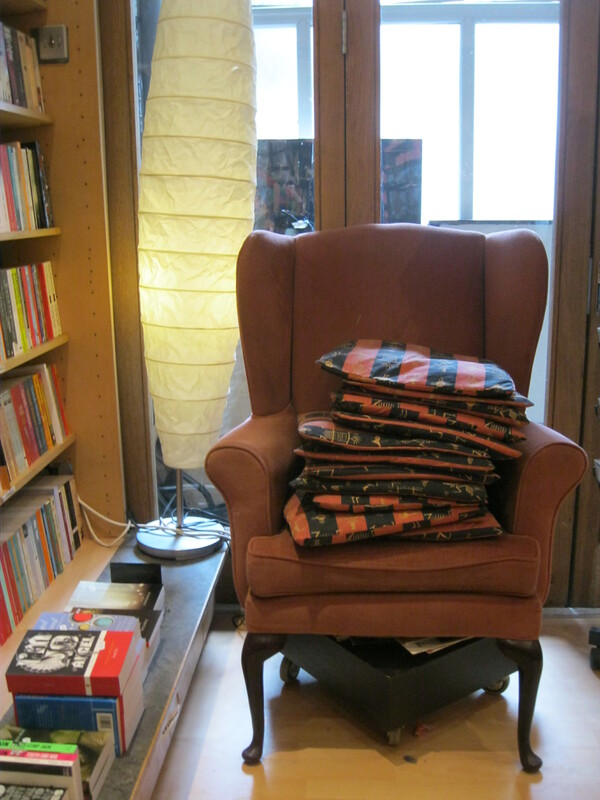 It’s a small room and contains a few too many toys and other non-book items for my tastes, but it is cosy and bright, with little child-sized chairs dotted around and a great selection of books for all ages. 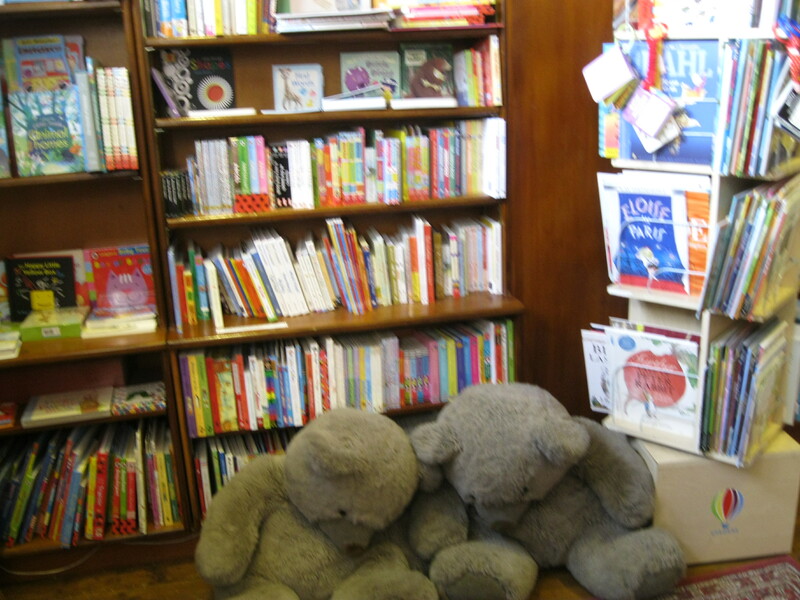 As a child who spent many hours curled up in the children’s sections of libraries and bookshops, I can tell you that a small and quiet nook at the back of a bookshop is all you need to bring to life the magic that grown-ups need videos and fancy editing to be reminded of. So shame on us, the adults. The ones who have accepted this opinion (whose opinion, again?!) that magic is kids’ stuff, that the closest we can get to it is a touch-screen smartphone or a device that is nothing but a pale shadow of a real book. What Type reminds its readers is that all that stuff is just a distraction for a distracted age impressed with its own petty party tricks. The real magic starts when you open a book, and let it open something in you, too. 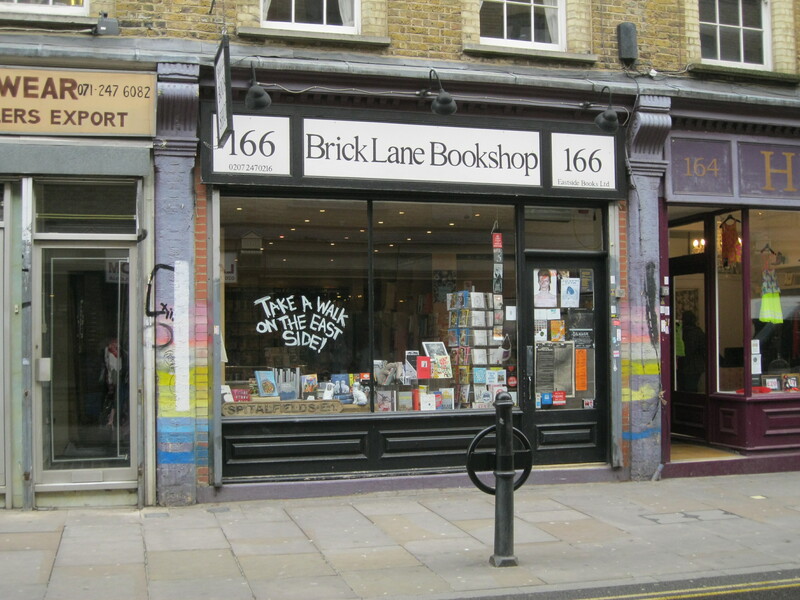 Having heard only good things about this small independent bookshop, I set out for a long walk along the canal on Saturday morning to make the pilgrimage to Broadway Market in Hackney. The walk along the canal, from the City Road Basin to Broadway Market, is beautiful in itself; it’s a quiet oasis right in the middle of the city, where a bewildering mix of people run, walk, cycle, stroll and eat at trendy al fresco bars, or with market food in their laps and their feet dangling over the edge of the canal. It’s the perfect example of urban living at its best. 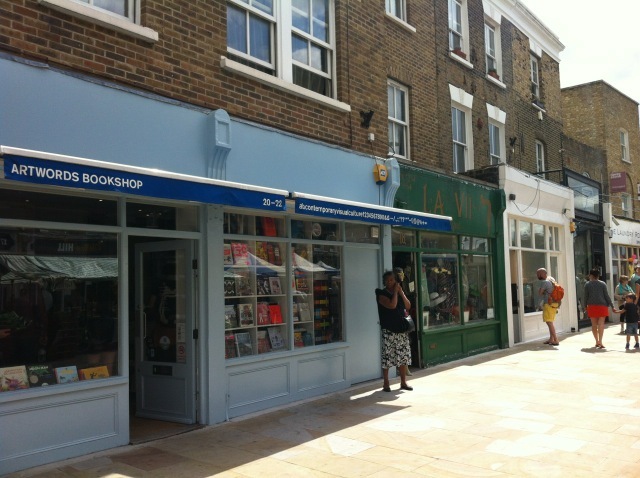 Broadway Market, too, is a bright spot of hope against the bleak prospects for the high street we’re constantly hearing. It’s the quintessential East London street, one of the few places in the city where you can still find a good jellied eel. 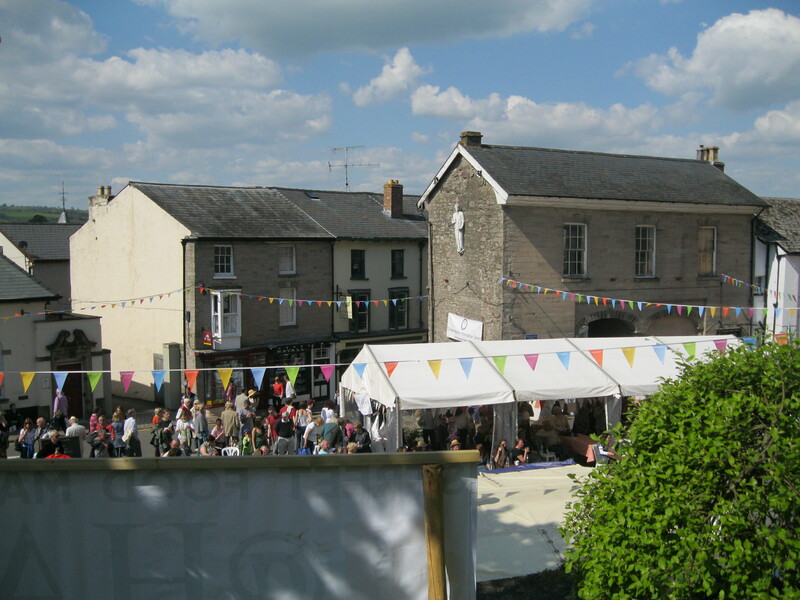 Stalls fill the road, making it an atmosphere where regulars or one-time visitors can interact with bakers, butchers, organic farmers, florists, artisans and booksellers. The independent shops along both sides of the street are busy hubs for the local communities, especially on a Saturday, when the music from street performs and the calls of merchants make it difficult to not want to stay a while. And it makes me happy that books are a central part of the experience. 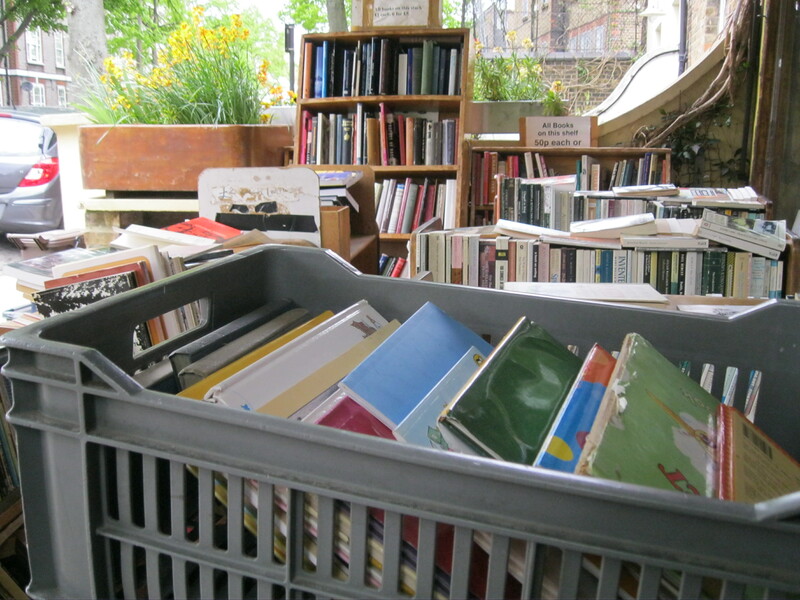 In the market itself, Barrow Books, who also pop up at the Goldsmith’s Row, has a stall covered in what is a great range of new and secondhand books, which provide great variety and a thoughtful collection and is very welcoming to browsers. 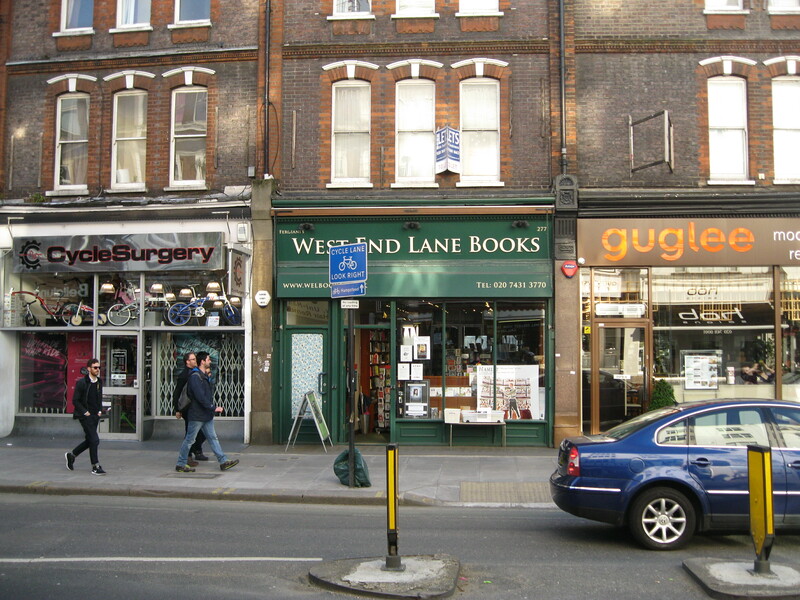 Donlon Books and ArtWords Bookshop are two art booksellers which keep Broadway Bookshop company. 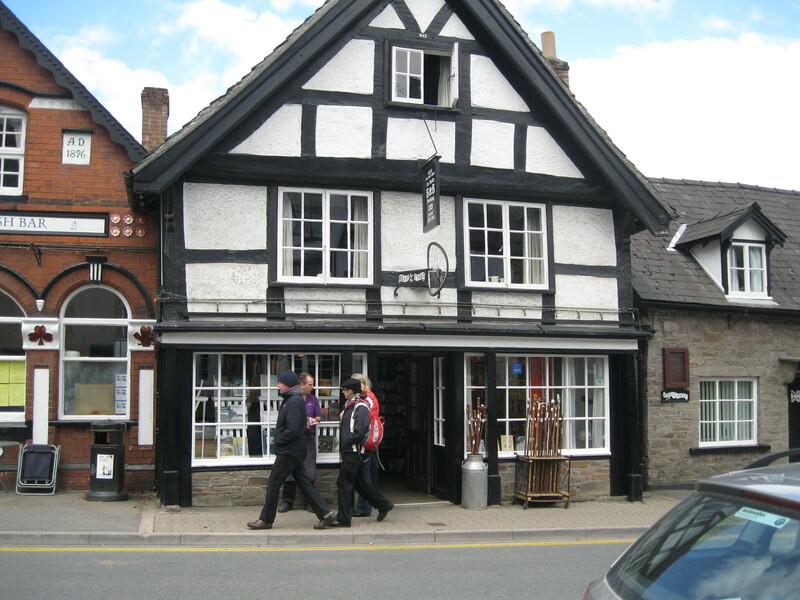 They are both worth a visit if you find yourself in the area, as they have really interesting selections. 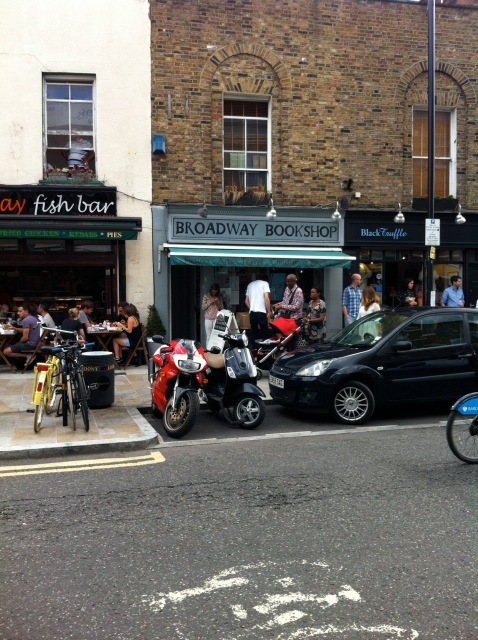 But be warned, both are absolutely crawling with hipsters, whereas Broadway Bookshop attracts a more diverse crowd, including local families and residents of all ages and from all walks of life. 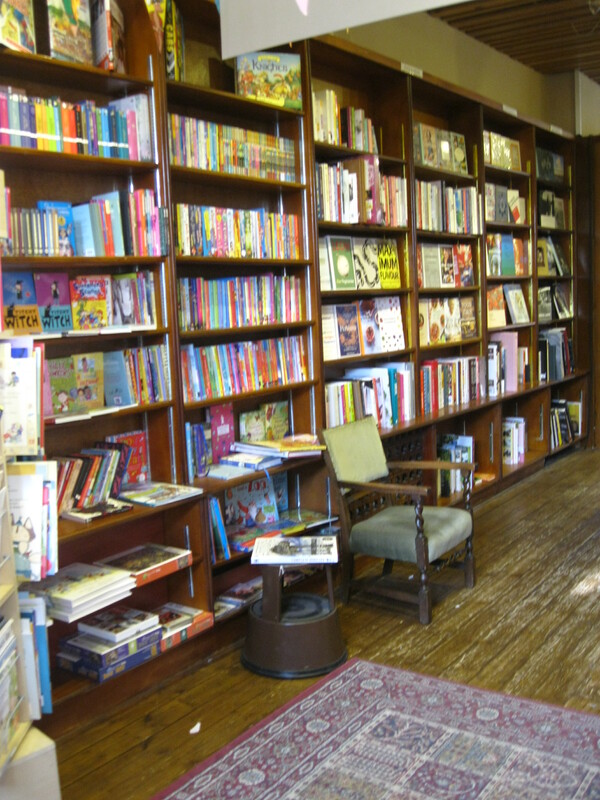 Broadway Bookshop is a central part of the community, as well as a great example of why we still need bookselling in the twenty first century. 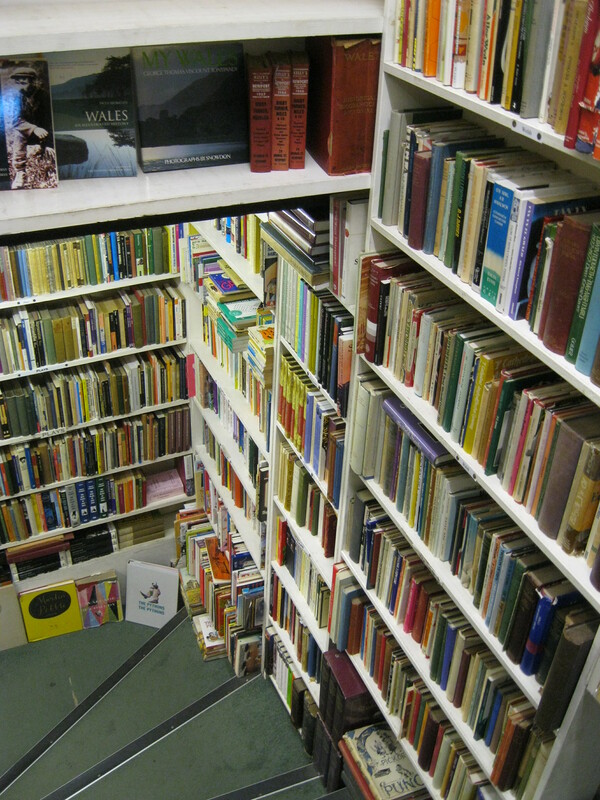 It’s a poky little shop with a surprisingly large collection, which stretches out over three floors. Which makes it sound a lot bigger than it actually is, since each of the floors is actually just one little room, absolutely crammed with books. But despite the almost overwhelming selection, it still looks neat and accessible. 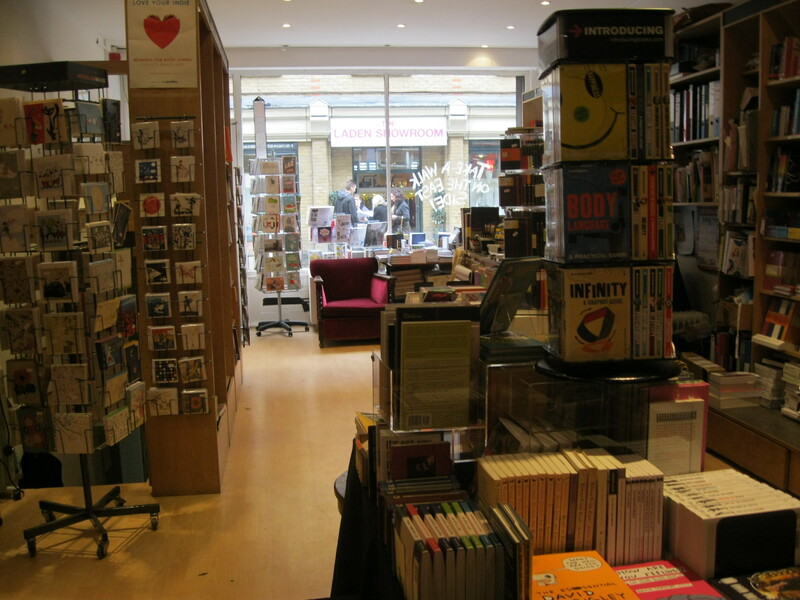 When you enter the shop on the ground floor (which on a Saturday is full of people), you are surrounded by music, art, architecture and fashion books, as well as a small section about Nature. This is nice in a way, at least for me, since it prevented me from following my usual routine and heading straight to fiction, never to be seen again. 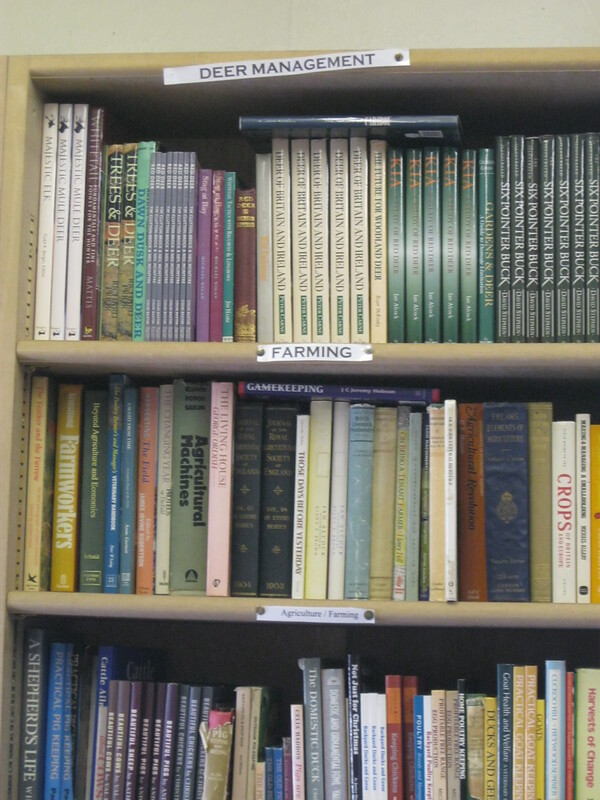 The bookshop stocks an informed and intelligent range of titles, proof once again of a great mind somewhere behind it, dedicated to filtering through what’s out there and bringing you the very best. It’s a selection that invites exploration and encourages you to think more deeply and more seriously about the world we live in, as it offers you the chance to investigate books that analyse our culture in new ways. If I was someone who still used Amazon, I can guarantee that it would be to order books by authors I already know, and that my life would be much poorer for it. 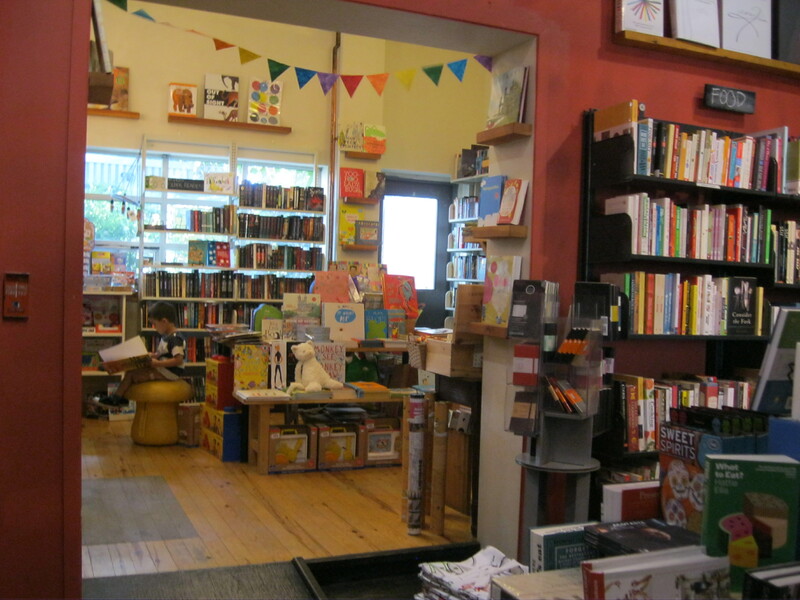 But thankfully, I’m someone who goes to places like Broadway Bookshop, where I’m forced to expand my mind and go beyond my usual routine. 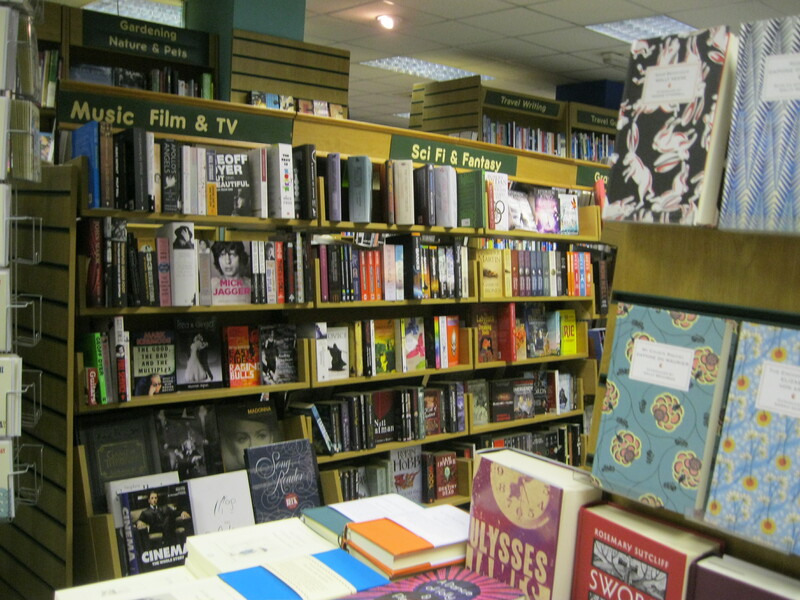 In shops like this, with a good selection, well-presented and inviting, I always find myself poring over the most unexpected books: histories of technology, essays on popular culture and feminist treatises that I couldn’t have found otherwise. My favourite thing about books is the way they make you look at familiar things again and see meaning in them you had never thought to look for. This makes us smarter people, braver people, more empathetic people. 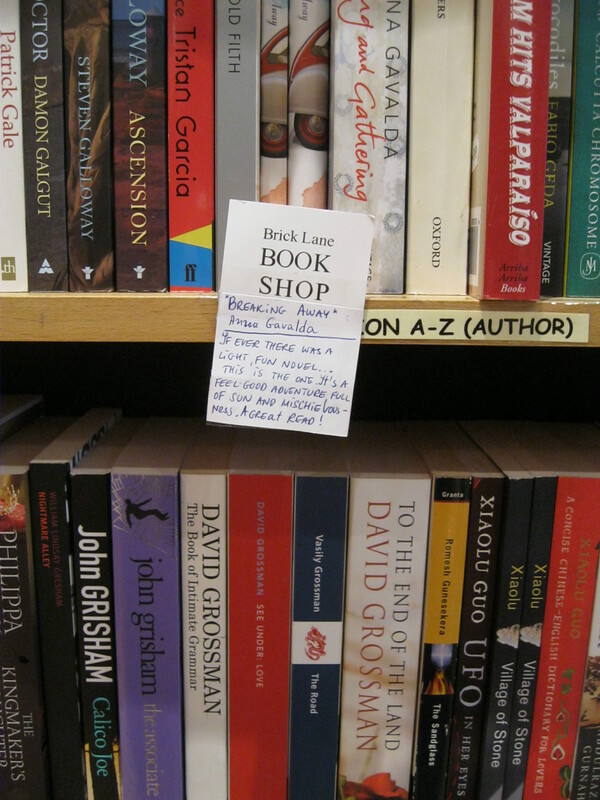 I have a feeling someone at Broadway Bookshop agrees with me. 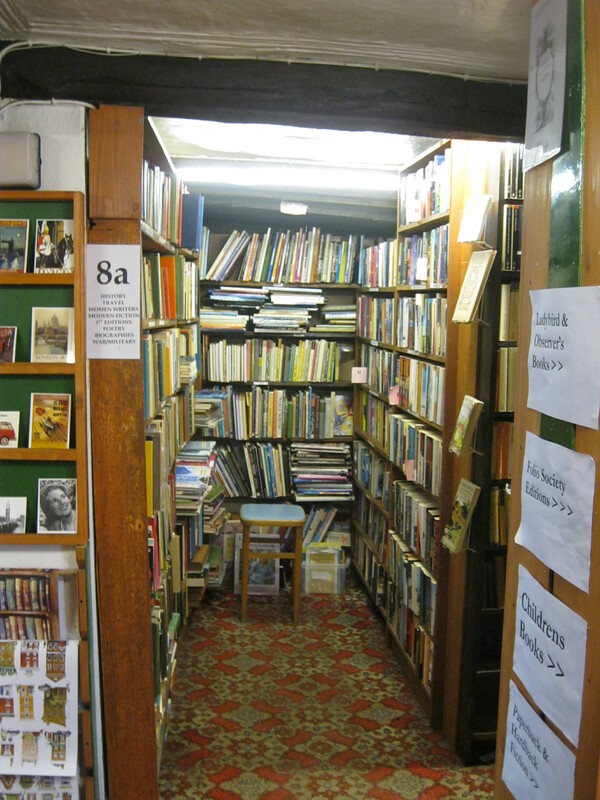 The shop is arranged in such an appealing way that it seems to pull you further in before you realise what’s happened, onwards to the next floor down. 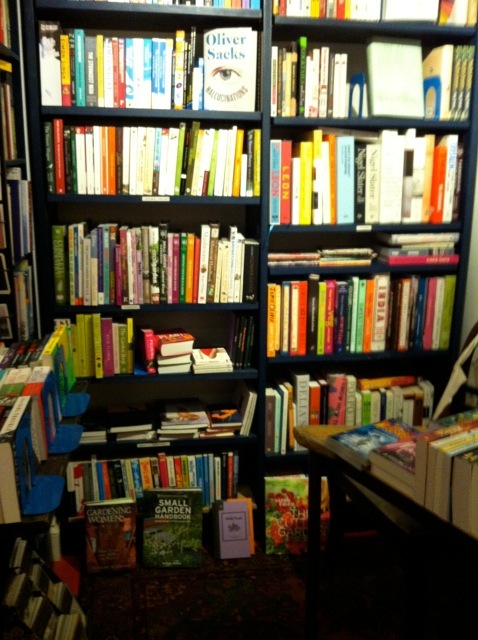 Here, you’ll find a great range of travel books, cookbooks, philosophy, fiction and children’s books. 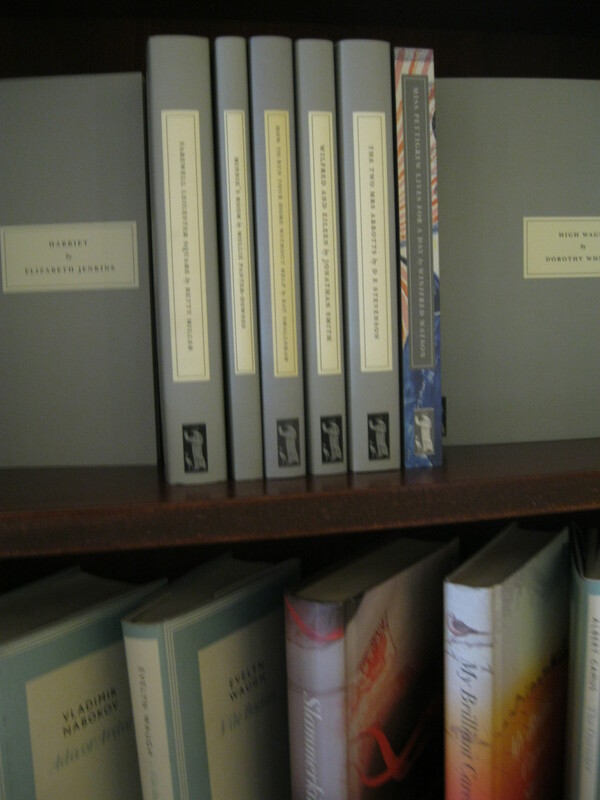 It was in the philosophy section that I found one of the books I came home with, Walter Benjamin’s Illuminations. Any regular reader of this blog will know that I adore Walter Benjamin. He’s one of the most intelligent people to live in the past century and he has a piercing truth or brilliant quotation for every occasion. I’ve read Illuminations about ten times, but have never had a copy of my own and now I do! The deciding factor in this decision was that it has an introduction by Hannah Arendt who I love almost as much as Benjamin. I felt a bit bad buying a book I’ve already read when presented with so many amazing new options, but then, you can’t argue with Book Fate. 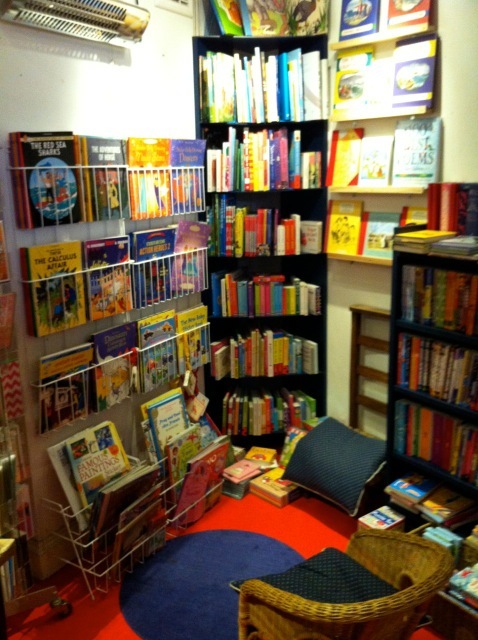 The children’s books have their own small but cozy corner, where a child-sized chair faces away from the rest of the room. It seems antisocial, but for anyone who was the kind of kid I was, this is exactly what you want; to shut out the rest of the adult world (and other loud children), put your feet up and turn some pages. It’s a perfect little hideaway, a quiet fort which defends the imagination from the cold and dreary world outside of it. 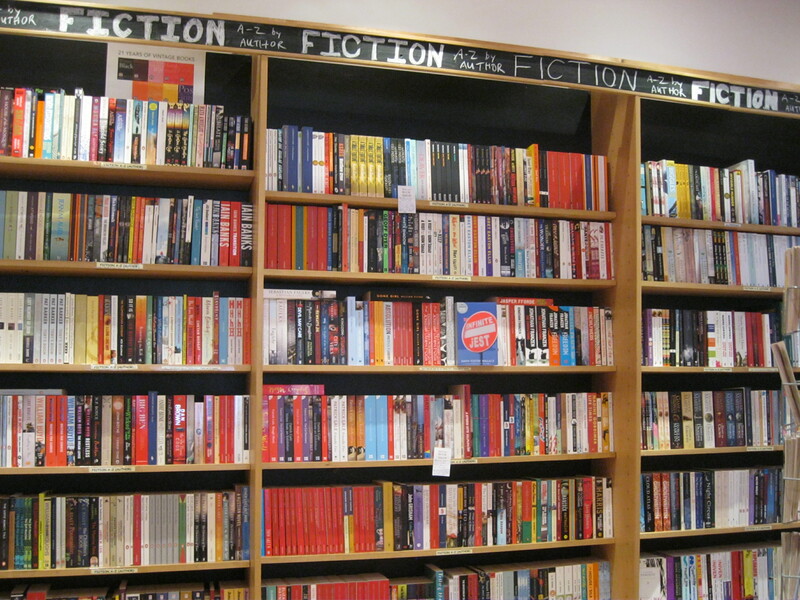 The fiction selection which covers the walls covers all different kinds of genres, in perfect alphabetical order. 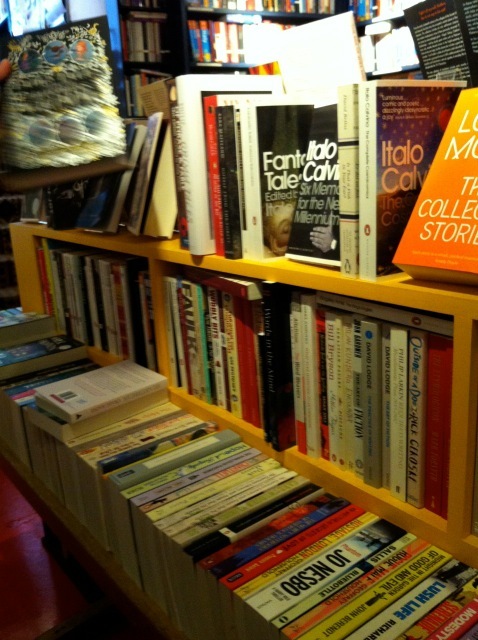 Including bestsellers, classics and contemporary novels from smaller publishing houses, the selection has something for every kind of book lover, but it’s presented in such a way that anyone can come in and have a look, no matter who they are and what they read. There is no snobbery in sight, even though being snobbish about a place like this would hardly be unjustified. There is a table in the centre of the room which puts the spotlight on some particularly interesting books, no doubt chosen with care. On it, you’ll find established and undisputed classics, like the complete works of Kafka and Nabokov (we came home with a copy of Pale Fire) as well as lesser-known masters (like Italo Calvino whom I cannot praise enough) and new titles, like May we Be Forgiven, the winner of this year’s Women’s Prize for Fiction and Philip Pullman’s adaptation of Grimm’s Fairy Tales, a gorgeous hardcover that I’ve wanted for months. 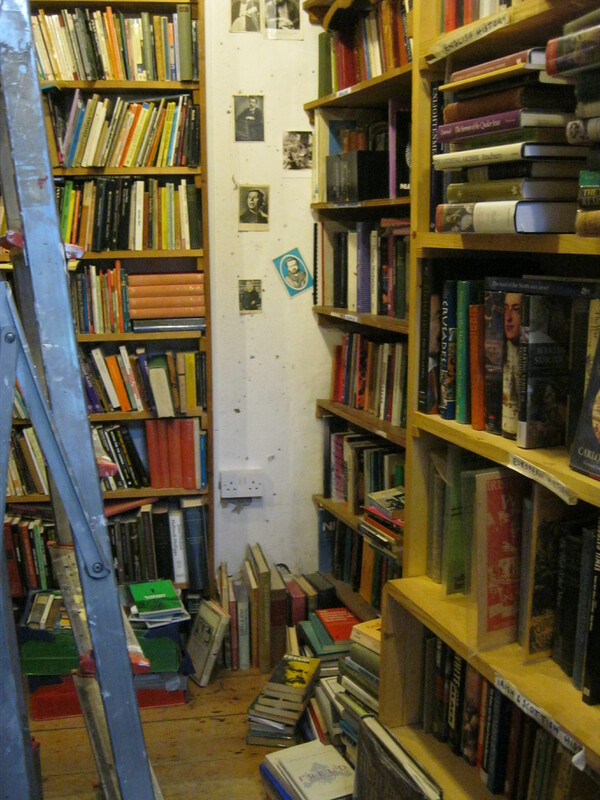 Finally, there is a small little nook that makes up the third and final floor of the shop, though it’s really only a half-storey. 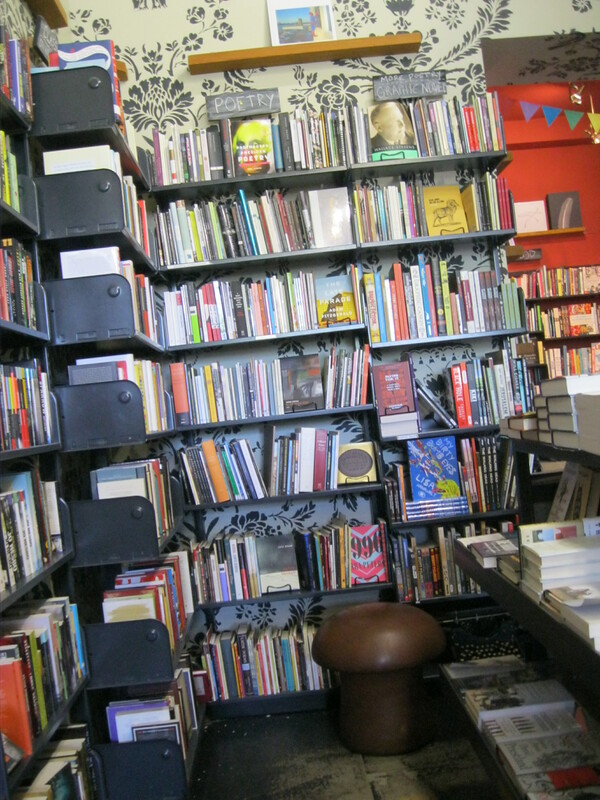 It’s only big enough for about two people at a time, which is a bit of a shame since it’s the home of the poetry, biographies and beautiful books. 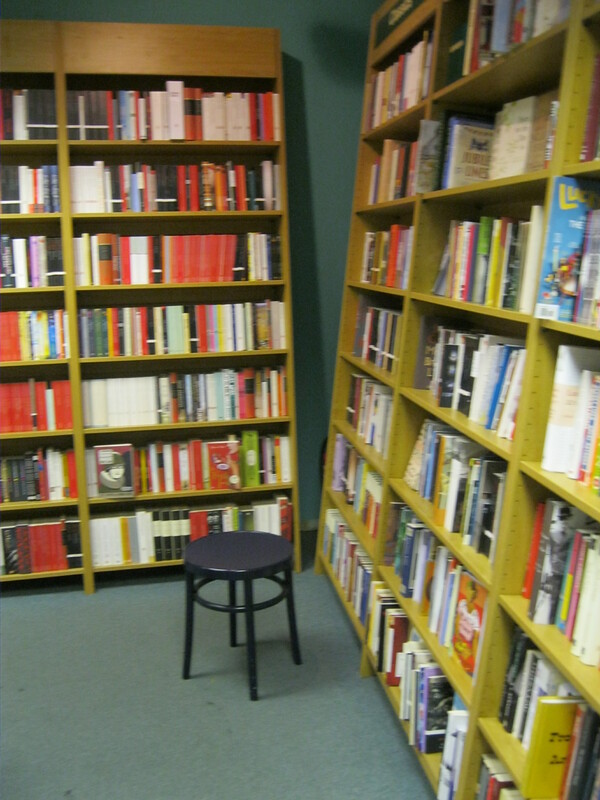 There is a small chair where you can sit and, since it’s such a cramped space, effectively cut off all other visitors, getting exclusive access to the wall full of poetry books from poets ranging from Chaucer to Billy Collins. A glass chest houses the treasures; a small selection of rare books and literary, political and music biographies are given a small but solid bit of attention. 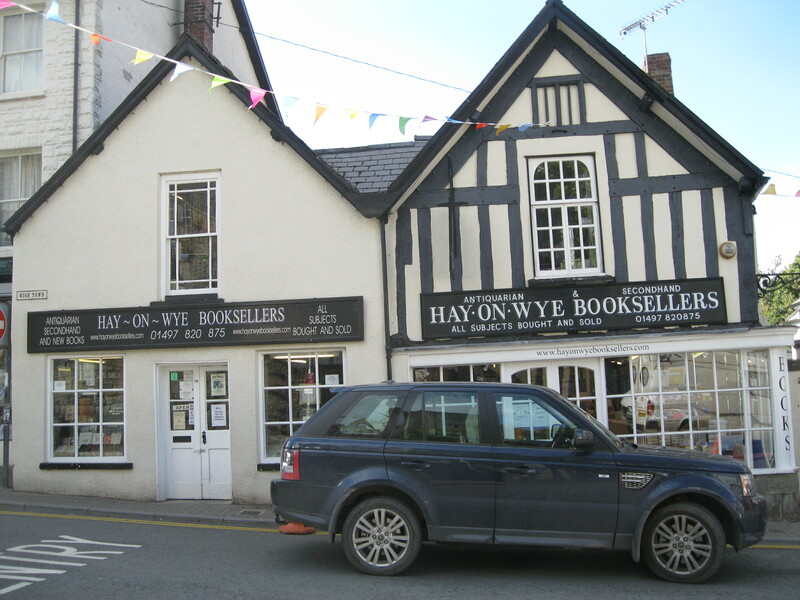 This bookshop is a special example of good bookselling, with a great and well-curated selection of interesting and inspiring books. But more importantly, the booksellers are warm and accessible, so it’s not surprising that regulars will have a chat about their latest read and ask for help when they need an expert’s advice. It’s a bit like an extended family, which welcomes browsers from all over the world to come in, lower their voices and do what they do best. – A Midsummer Night’s Dream, Act 3, Scene 2, ll. 325. 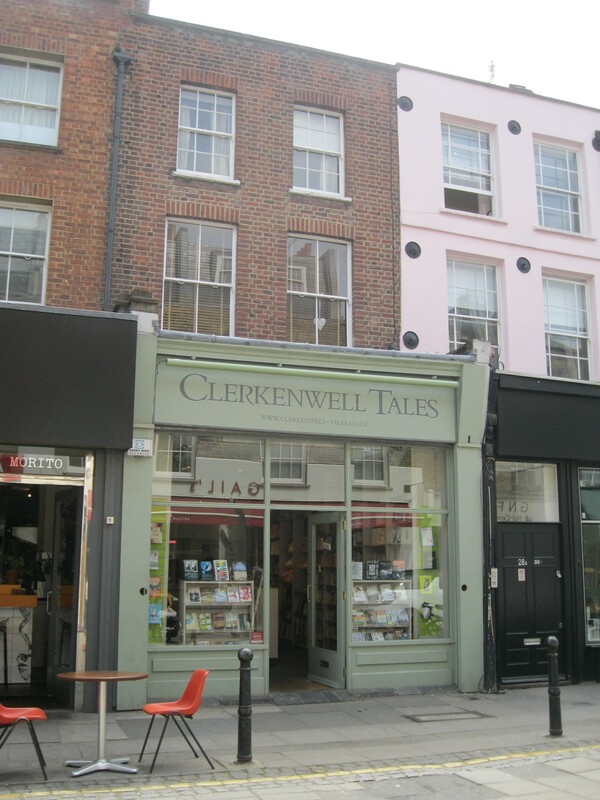 I started off my Independent Booksellers’ Week with a pilgrimage to Clerkenwell Tales, a small but mighty bookshop on Exmouth Market. 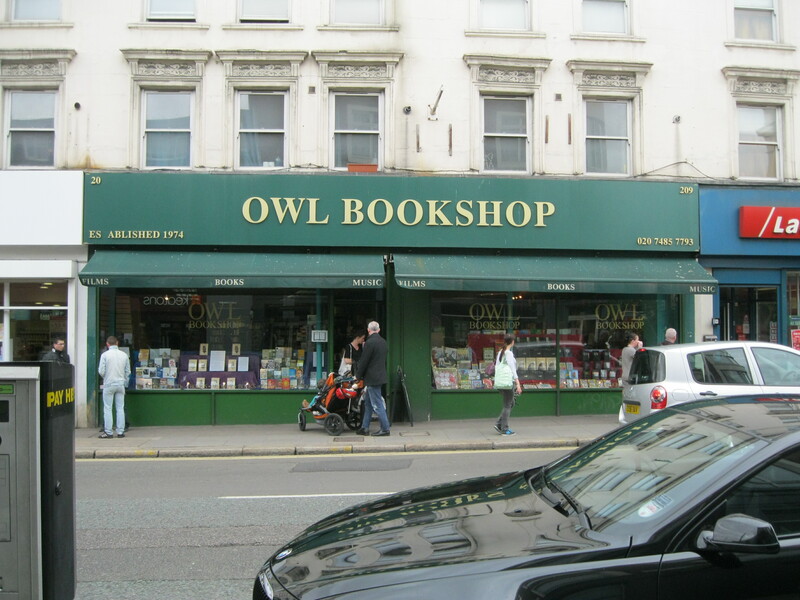 This is one of my favourite bookshops to pop into for a quick browse, just to see what’s new and stand in its welcoming atmosphere for a few minutes, even if I don’t buy anything. I first started going because it was right across the street from our go-to breakfast place and bakery, Gail’s. After filling up on their legendary hotcakes (served up with pears and walnuts), a long walk home is appealing and that walk is never complete without a stop at Clerkenwell Tales. This morning, a sunny if slightly nippy Saturday, the street was busy with people idly strolling, peering into the windows of shops and restaurants. 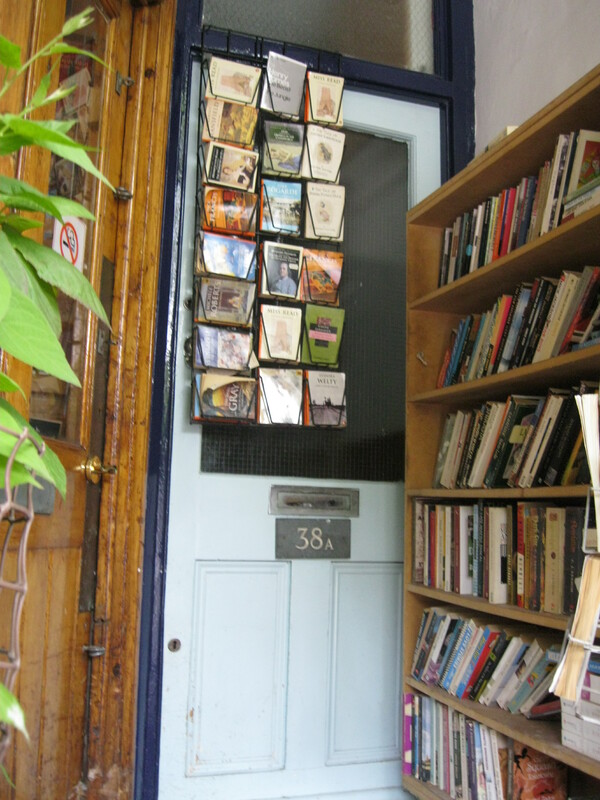 Here, like on any good London street, a beautiful independent bookshop was the heart of this community: inclusive, inviting and the perfect addition to an already lovely day. This shop is small, but that’s far from a problem. 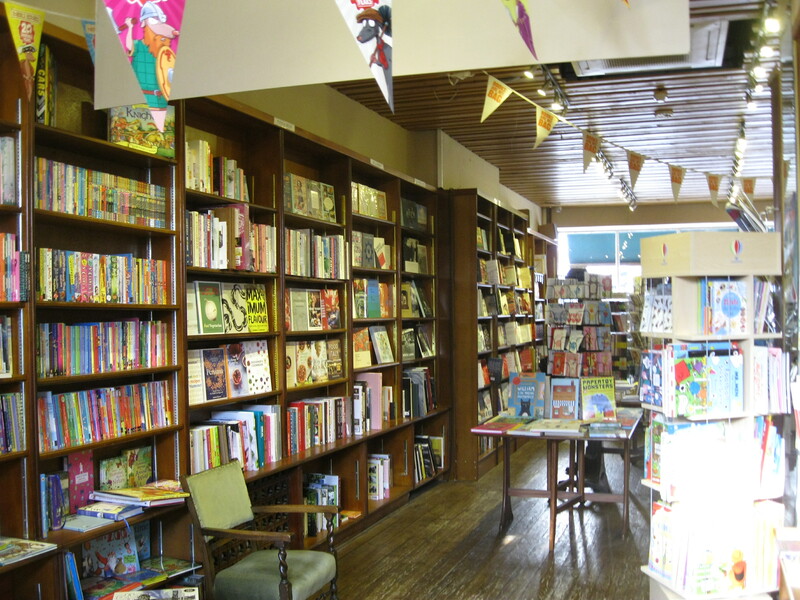 With only one room, the booksellers have used impressive ingenuity to create a space which feels like a traditional bookshop, but is actually quite different. 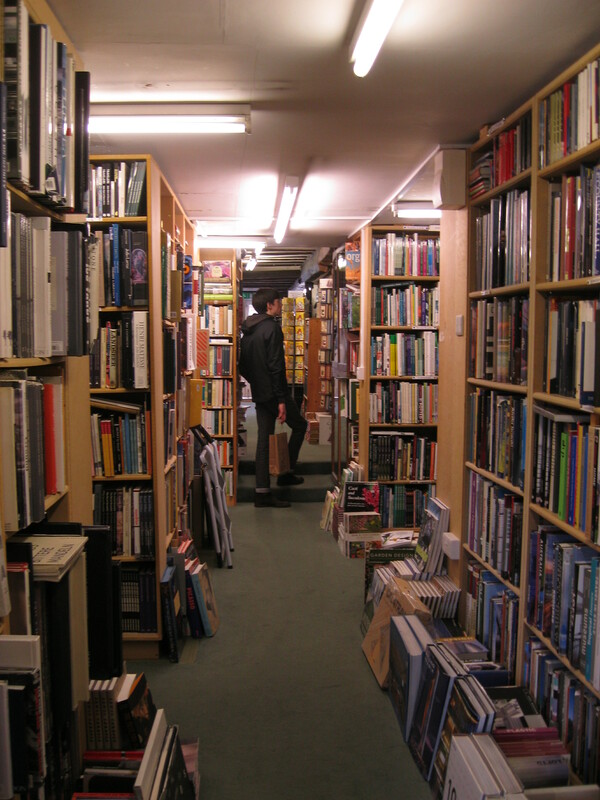 As they’re working with less space, they simply can’t have the same quantity as larger shops and piles of books would ruin the neat and elegant layout of the shop. 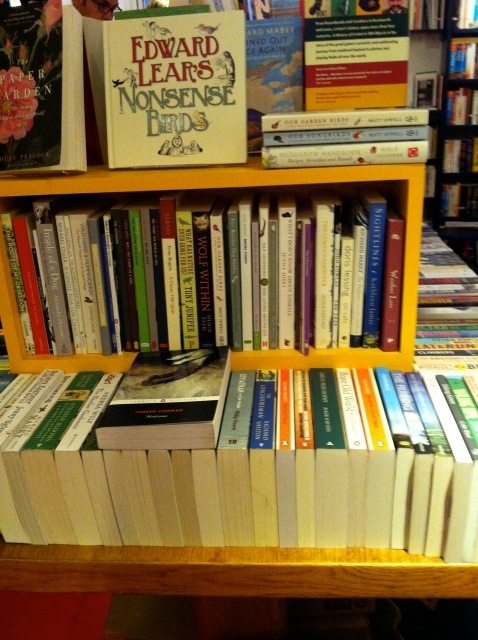 Instead of trying to squeeze everything in, they’ve chosen to be selective and offer a carefully curated range of fiction and non-fiction titles. This is clear just from looking at the books on display in the window, a clever and sophisticated mix of contemporary fiction, local interest and thoughtful, relevant non-fiction books. An excellent taste in and passion for good books is evident, reminding us that quality is always more important than quantity. 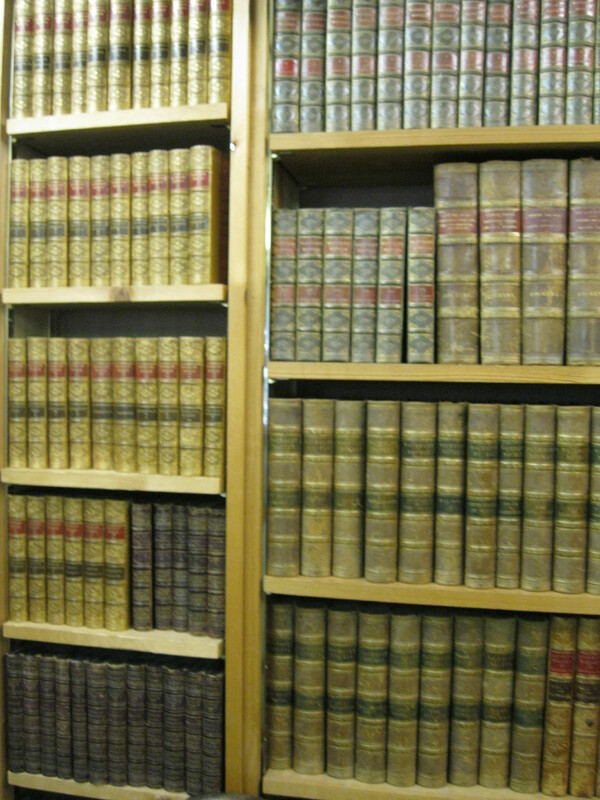 The books are divided into several different sections. Of course the largest one is dedicated to fiction and, while the selection can hardly be called wide, it is thoughtful and inspiring. I had my eyes on Cat’s Eye by Margaret Atwood (the main character is called Cordelia, a name I’ve adored ever since I first read King Lear) and Jackie Kay’s Reality, Reality which I’ve been meaning to read for ages. 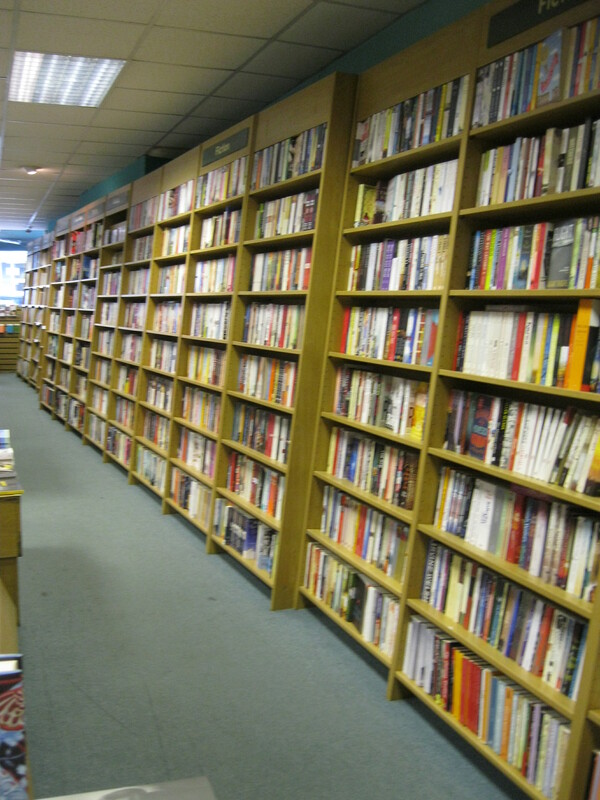 The next section is ‘Books We Love,’ an entire bay full of books recommended by the book-loving staff who appear to be well-read people with impeccable taste. 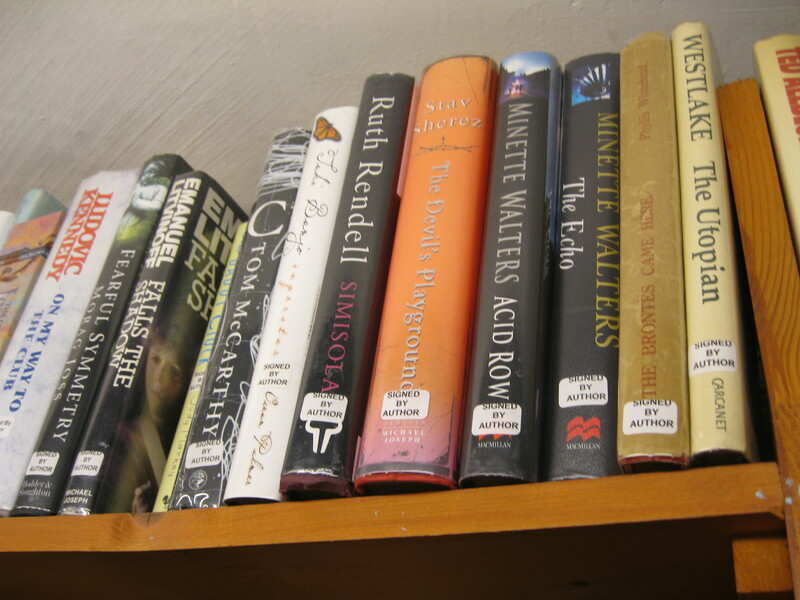 The offerings I saw today mixed contemporary fiction with political biographies and classic novels. It’s slightly disconcerting but also amusing and refreshing to see Kafka sitting beside Tessa Hadley and I think it encourages us to think about our own diverse tastes in literature and leave behind the silly idea of dividing the books we love into categories. This only creates a false sense that we, the readers, as well as the writers we love can be pigeon-holed, when really, who gets to decide that a die-hard Jane Austen fan can’t sandwich his/her copy of Pride and Prejudice between A Game of Thrones and If on a Winter’s Night a Traveller? We’re all complex people and, as Clerkenwell Tales’ mix of genres and styles reminds us, our reading habits should be as diverse and idiosyncratic as we are. 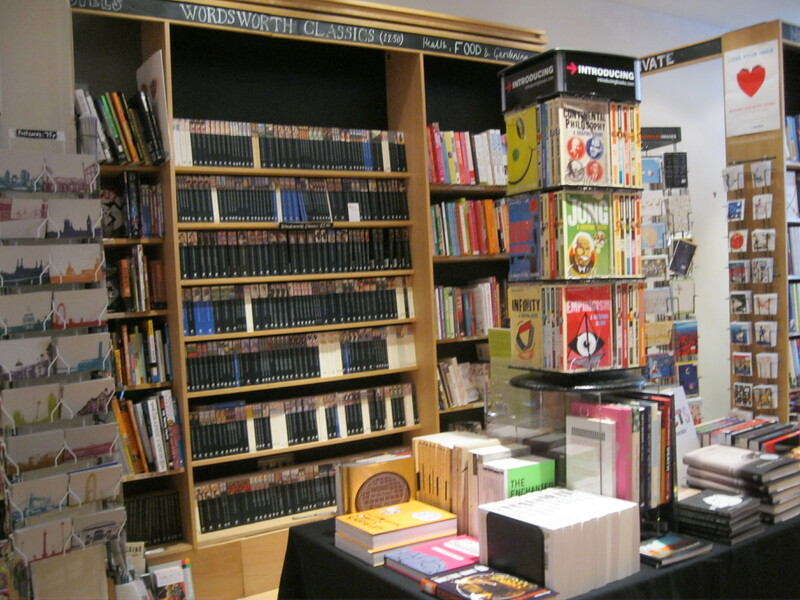 The shop also has a wide selection of books about politics and culture, as well as some about food and the arts, most of which are clustered around the table in the middle and arranged beautifully. 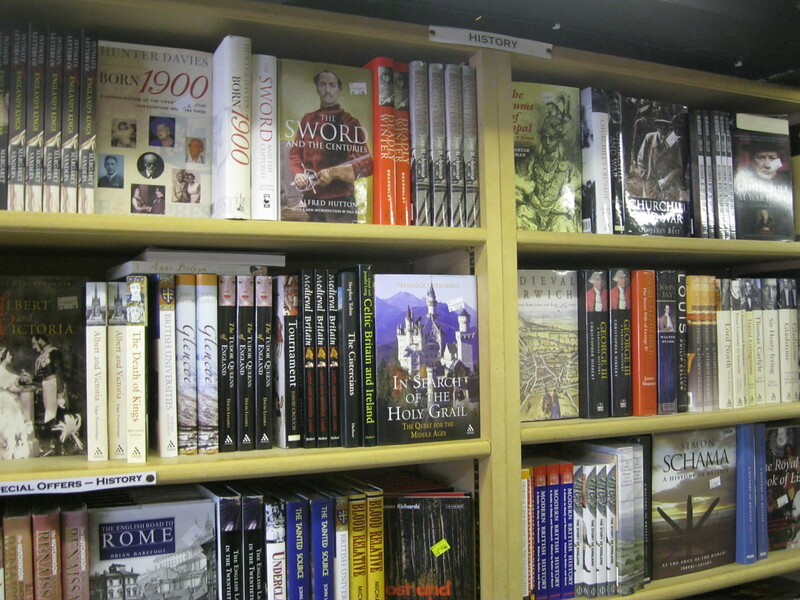 The smaller number of books works well in this shop, as each one is given more of a spotlight. This means, of course, that they all have to be the kind of book that will shine. Judging from how long I spent wandering around this central table, that mission has been accomplished. 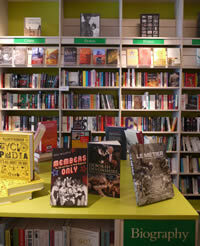 Other interesting sections include ‘London’ – which features books about the city, famous literary Londoners and the history of the Clerkenwell and Farrindgon areas – and ‘Great Gift Ideas’ where you can find biographies of famous authors and artists, beautiful books of poetry and Penguin’s fantastic ‘Great Loves’ series of short stories and novellas about romance in beautiful pocket-sized editions. Finally, there’s the ‘New and Recently Reviewed’ bay. 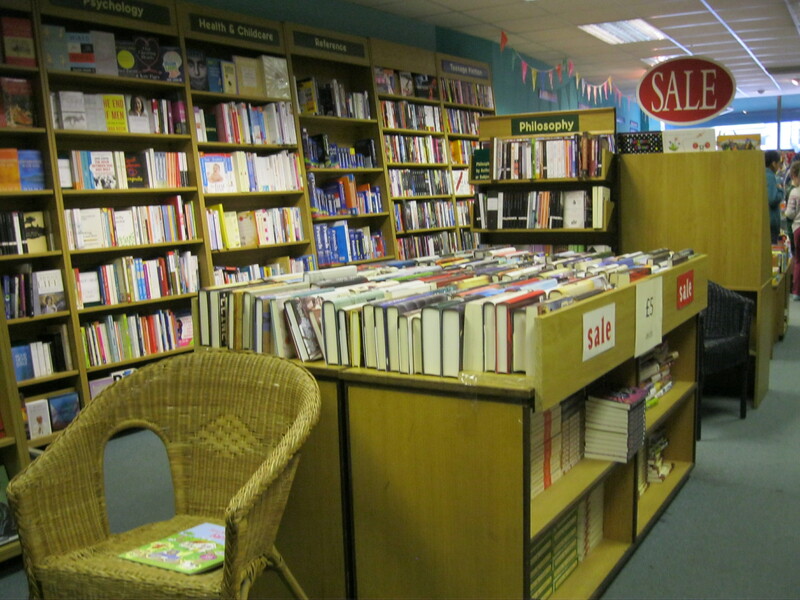 In the past year, as I’ve visited and written about dozens of bookshops, I’ve learned that a section dedicated solely to new books always indicates a good bookshop, one where the staff are knowledgeable and literature is taken seriously. 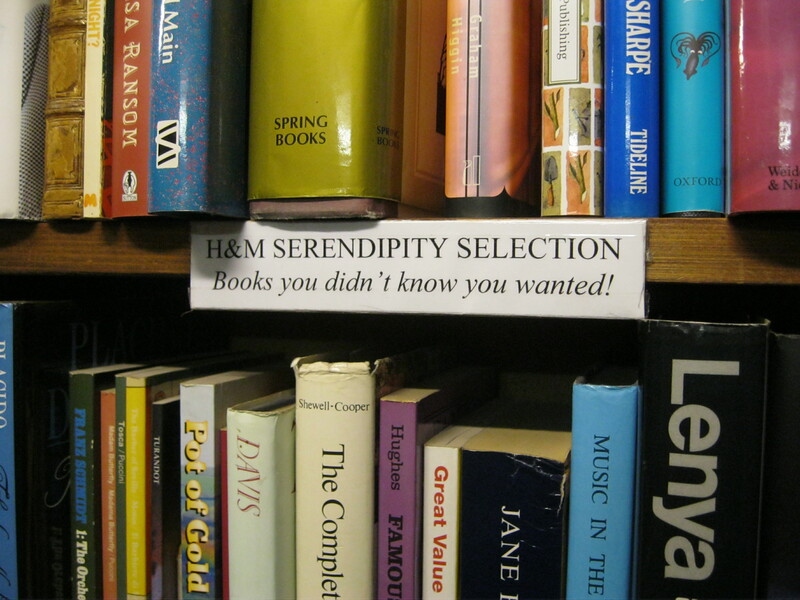 Perhaps my favourite section is ‘Great Ideas’ where a varied and – to some eyes – random collection of books invites the reader to pick up something new and unexpected that if you let it, might teach you something new or make you see old things in a new light. Zadie Smith’s Changing My Mind: Occasional Essays caught my eye in particular, but it was surrounded by shelves full of other though-provoking collections of essays, biographies and works of non-fiction that encourage us – yes, us, who ‘google’ the answer to everything before we’ve even thought about it – to actually use our brains for a change. And, in a way, that’s what Clerkenwell Tales is there for. In its own quiet, unassuming way, it asks us to look inwards and examine our lives and to reflect on our world and the way we live in it, encouraging us to think critically, cross boundaries and surprise ourselves. Just like the best books always do. 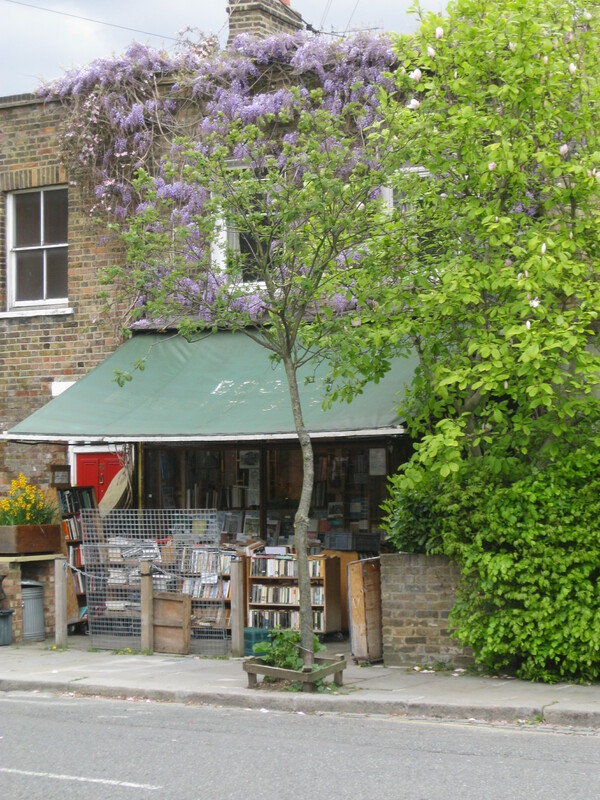 Covered in beautiful purple flowers and the overspill of vines from the house next door, Walden Books is an inconspicuous fairy tale cottage hiding on a quiet residential street in Chalk Farm, a refuge just moments away from the noise and confusion of Camden Lock Market. Outside, inexpensive fiction and poetry books draw wanderers in for a quick browse through the books outside on the terrace. 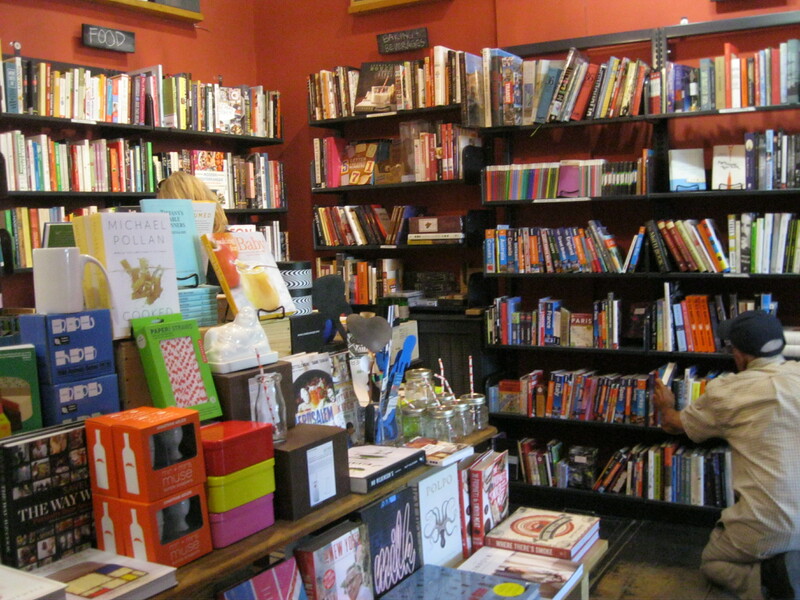 The brave or curious venture further, into the bookshop itself. The little brass bell that announces the entrance of a customer probably only rings a dozen times a day, so the shop attendant will notice you. He’s a lovely, friendly man who waved me through to the back room without having to surrender my bag. I’m shocked but delighted to learn that I don’t look like the kind of person who’s going to steal books. 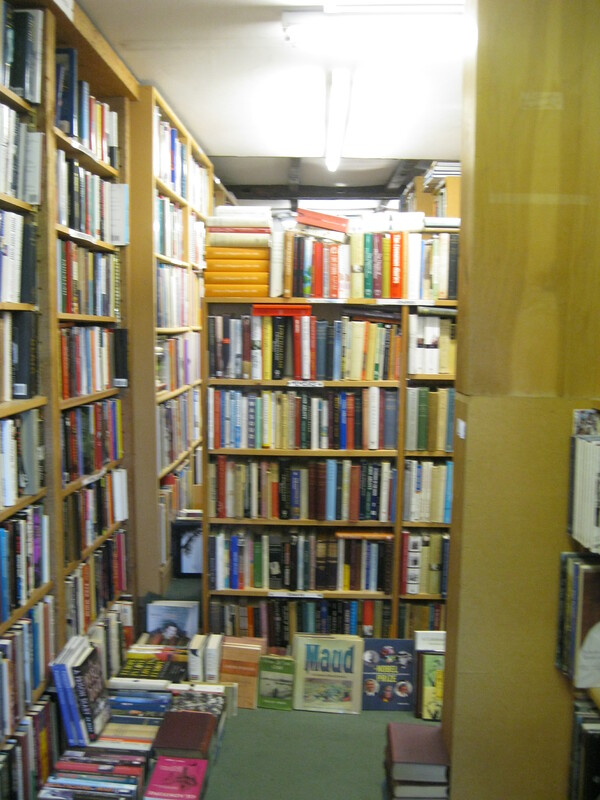 Luckily, I got the chance to browse through the small, cramped shop privately, with only one other customer arriving as I was on my way out. 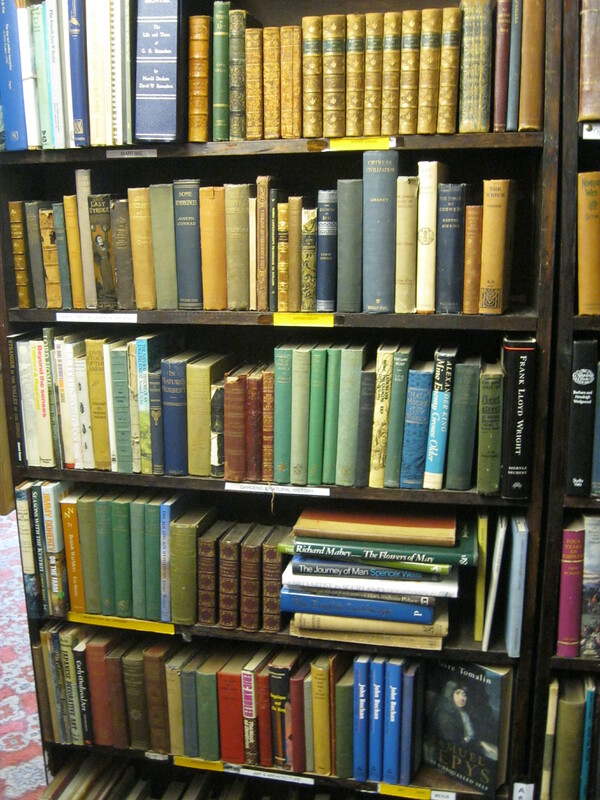 The front room has antiquarian books and a whole bay full of secondhand books about London, ranging from the recent to the antiquarian and covering different areas of the city. Sneaking past the till, I squeezed into the small back room. 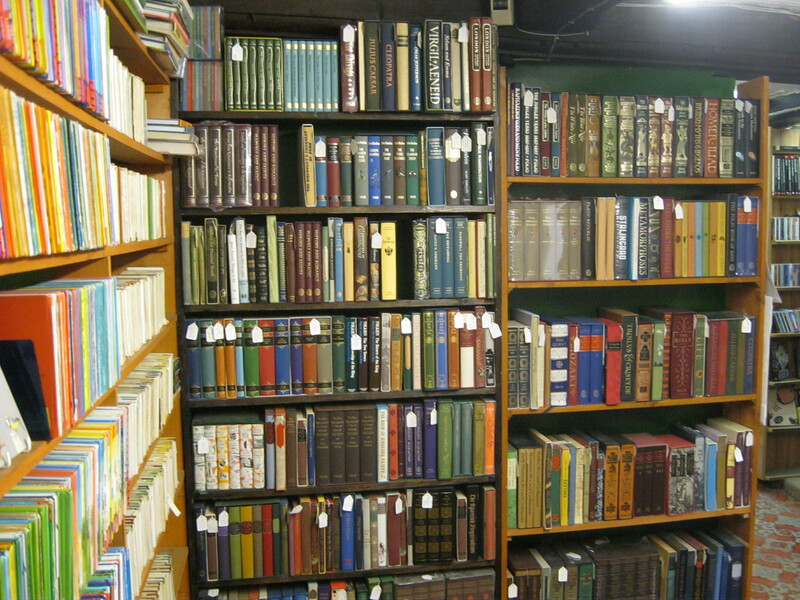 For the limited amount of space, Walden Books has an impressive selection of secondhand books. 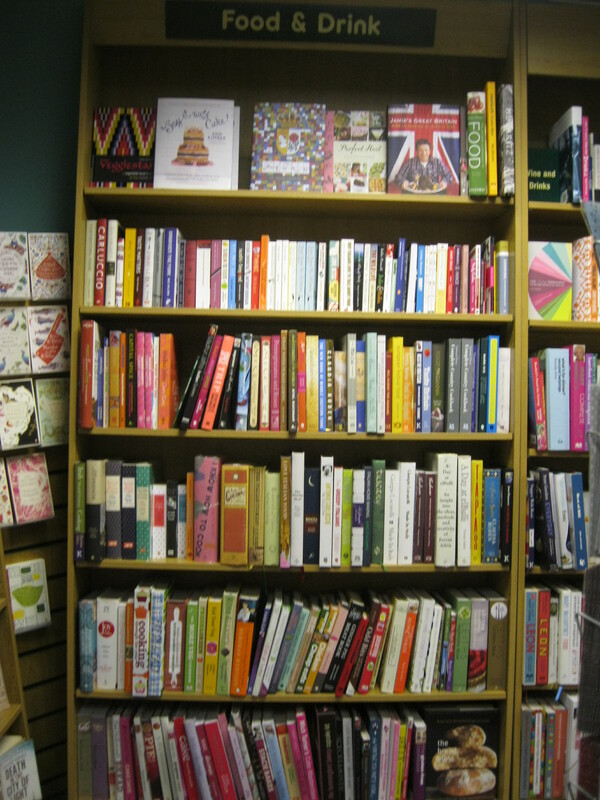 Books are everywhere, organised horizontally, vertically and diagonally. 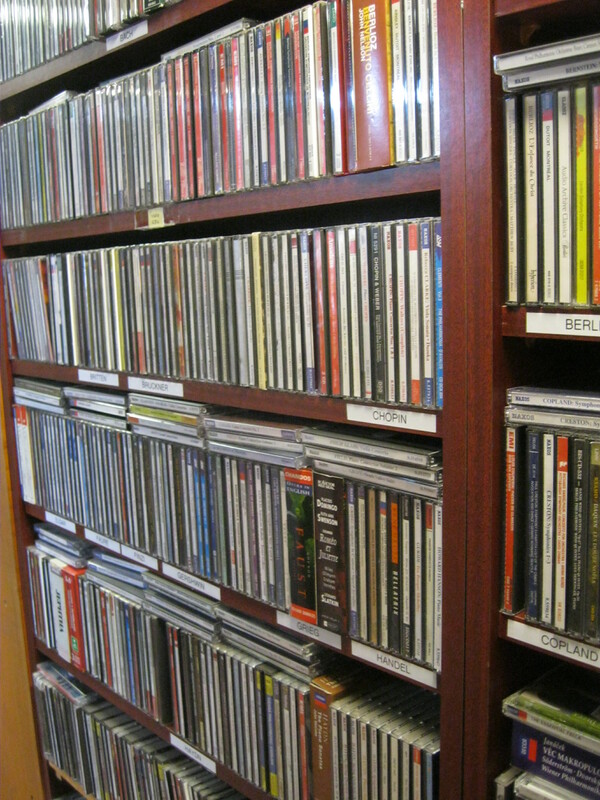 For the most part they are actually in vague alphabetical order (miraculously), but there are some who spill off the shelves and huddle on the floor at their feet. 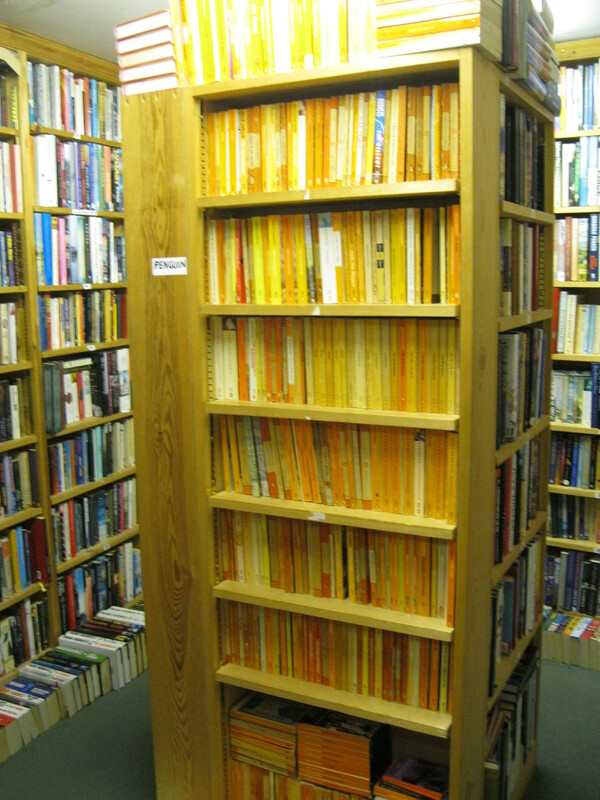 The large column in the middle (covered by books) makes the room feel more cramped, but provides a little bit of privacy so that browsers can hide in corners surrounded by the smell of paper and imagine that they’re completely alone. 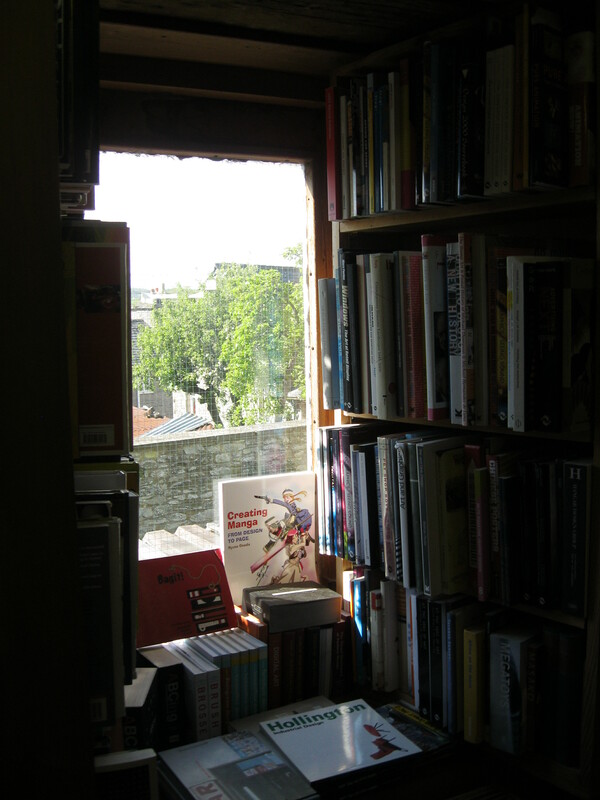 In these quiet corners, the browser will find fiction and poetry as well as a huge selection of plays. Normally, when you ask to be directed to the drama section, you encounter one shelf. Fifty percent of it is occupied by William Shakespeare. He’s absolutely brilliant, of course, and deserves his spot in all of our hearts and on all of our shelves, but has drama not progressed at all in the last 400 years? Answer me, Waterstones!! The other half will be filled with various copies of A Streetcar Named Desire, Doctor Faustus, Death of a Salesman and, if you’re lucky, an Ibsen or two. It’s all very limiting and predictable. 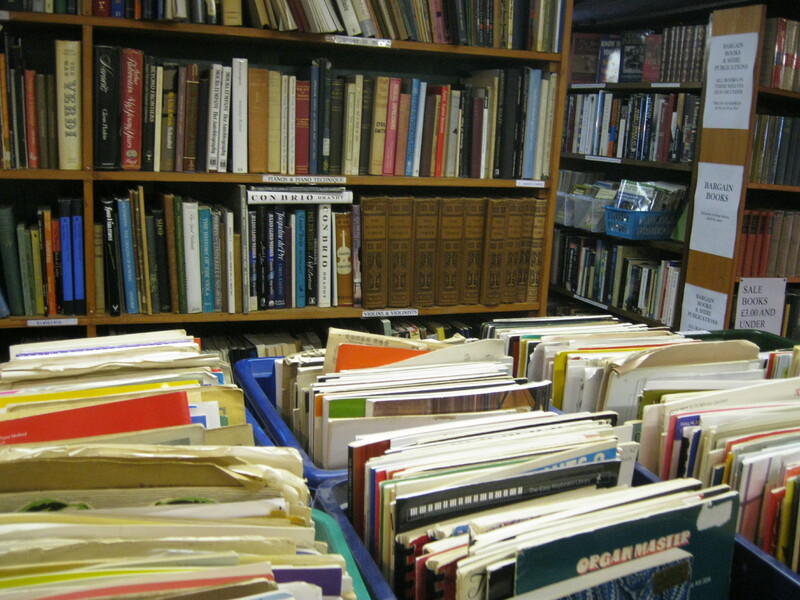 But at Walden Books, the plays – dug up from some very interesting people’s attics, I have no doubt – represent a huge range of time periods, cultures and genres. Even if you don’t buy anything, it’s worth going and browsing around just to get some new ideas in your head. I have a little red notebook that I carry around with me whenever I go into bookshops to write down the names of books and authors I discover. The list is so long now that I’ll probably never get through them all, but for some reason writing them down makes me feel one step closer to having read them. 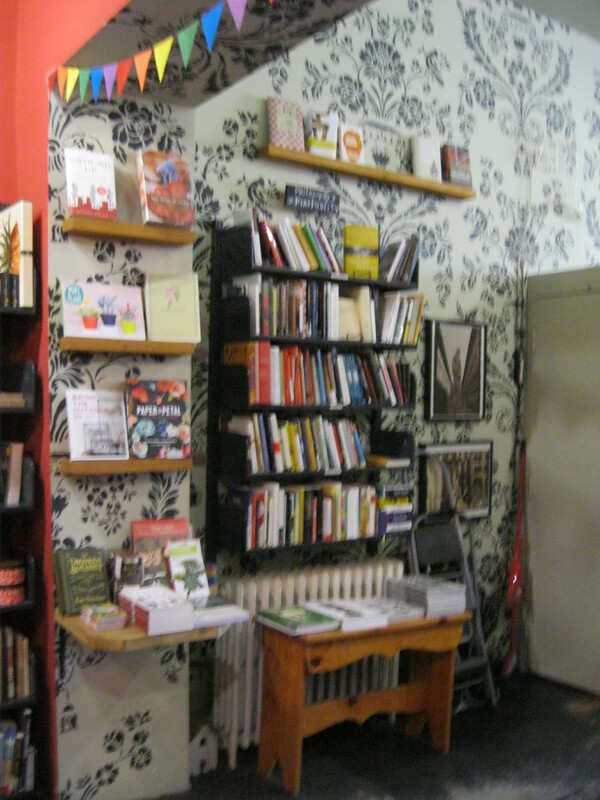 A whole wall of the middle column is dedicated to poetry. 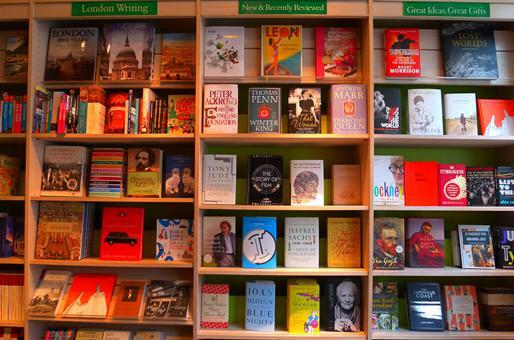 Again, it’s refreshing to see variety rather than the one typical one bay dominated by Keats, Shelley, T.S. Eliot and Carol Ann Duffy. Again, all are brilliant, but there’s so much more out there! My favourite discovery in Walden’s today was a copy of Ezra Pound’s Selected Poems. It felt slightly serendipitous since just the other day I almost got sucked into buying a book of Pound’s translations of Chinese poetry for £4 at the Southbank Book Market. The best thing about it was that someone had tucked a clipping from the Times in April 1970 into the front of the book. The clipping contained a poem by Pound which I think was called ‘The Pigeons’ which I have mysteriously not been able to find mention of anywhere else. Is anyone able to illuminate? Whenever see something stuck in a secondhand book, I can’t help but wonder what the thought process of the bookseller is when s/he finds it. Does it cross his/her mind to throw it in the bin, as the refuse of an older reader, of does it get to stay in because it adds to the value of the book? I sincerely hope it’s the latter. Apologies for blurriness. And my generally terrible photography. 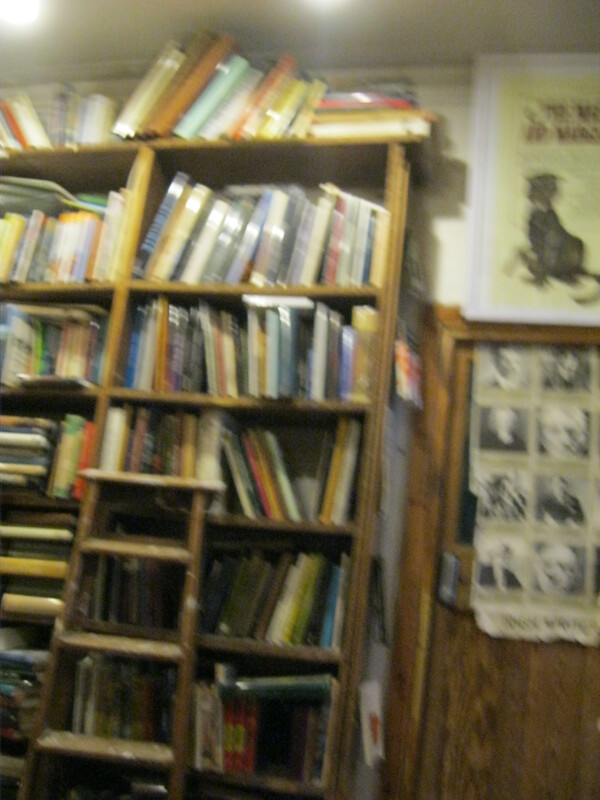 Despite the clutter, the confusion, the awkwardness of being one of two strangers in a very small space and the unorthodox collection of books, there is something beautiful about Walden Books. It’s messy, scattered, dusty and dingy. It’s madness, yet there is method in’t. It is full of a chaotic promise, that if you have the patience to sit and look, turn pages and inspect overleaves, you too can be part of something magical. 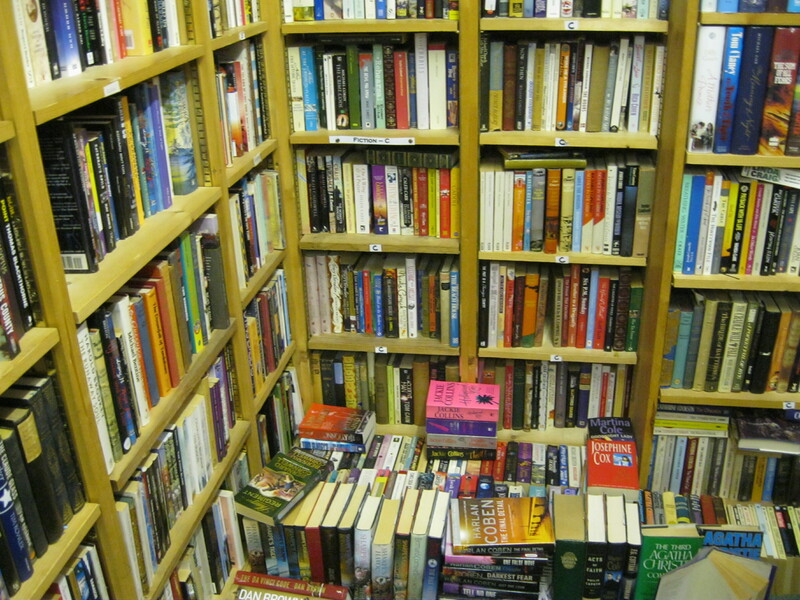 It doesn’t have the sanitary neatness of a chain bookshop or – worse – of your Kindle’s ‘library’ if we must use the word, but it has something infinitely better. 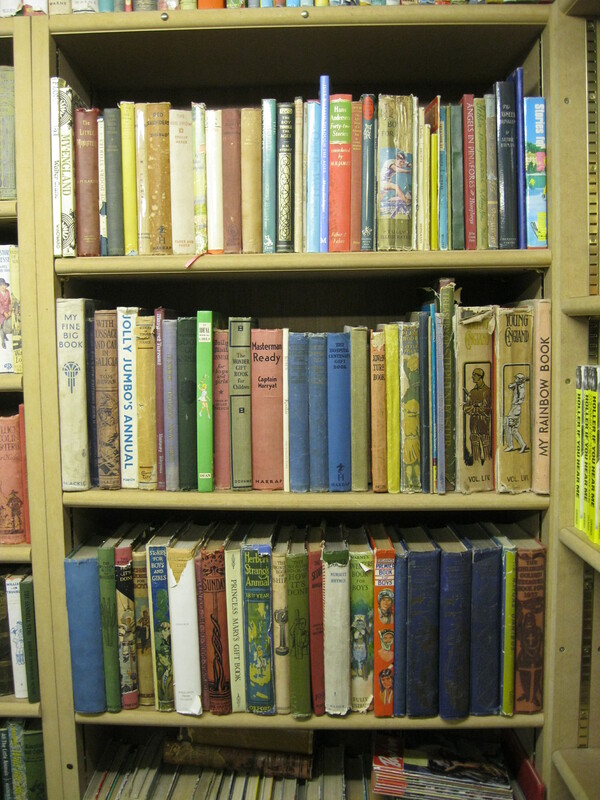 It reminds us of the simple beauty of a row of old books and the promises they make to anyone brave enough to pick them up.